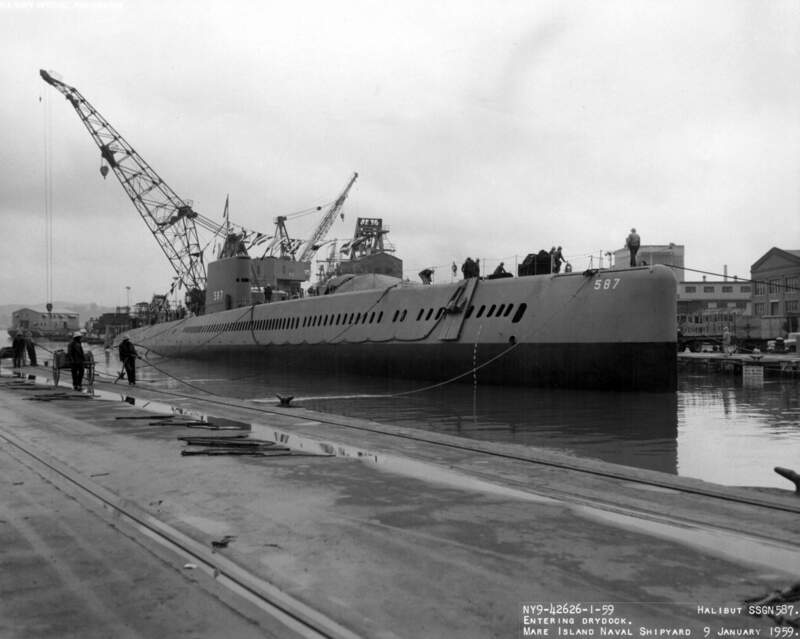 Halibut Class Guided Missile Submarine: Laid down, 11 April 1957, at Mare Island Naval Shipyard, Vallejo, CA. 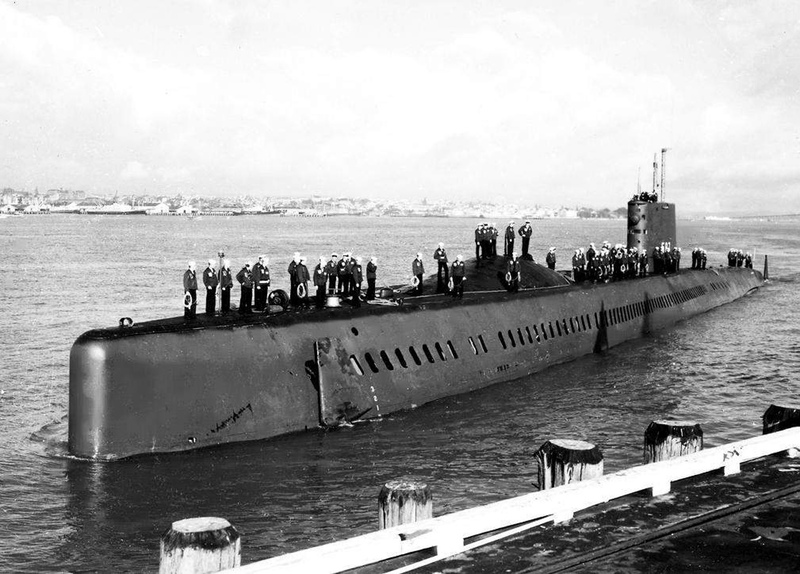 ; Launched, 9 January 1959; Commissioned, USS Halibut (SSGN-587), 4 January 1960; Converted to an Attack Submarine at Pearl Harbor Naval Shipyard, 6 February 1965 to 6 September 1965, Redesignated (SSN-587), 8 August 1965; Decommissioned, 30 June 1976; Laid up awaiting disposal through the Nuclear Powered Ship and Submarine Recycling Program (NPSSRP) at Puget Sound Naval Shipyard, Bremerton, WA., at Puget Sound Naval Shipyard, Bremerton, WA. ; Struck from the Naval Register, 30 April 1986; Final Disposition; disposed of through NPSSRP, 9 September 1994. Specifications: Displacement, Surfaced: 3,655 t., Submerged: 5,000 t.; Length 350' ; Beam 29'; Complement 9 Officers 88 Enlisted; Armament, one Regulus missile launcher, (could carry *five* Regulus I missiles, and potentially could have carried the Reg II but that program was cancelled before it ever got the chance), six 21" torpedo tubes; Propulsion, S3G nuclear reactors, **double five bladed propellers. **(Contributed by Don Hulse, EMC9SS0 USN RET). 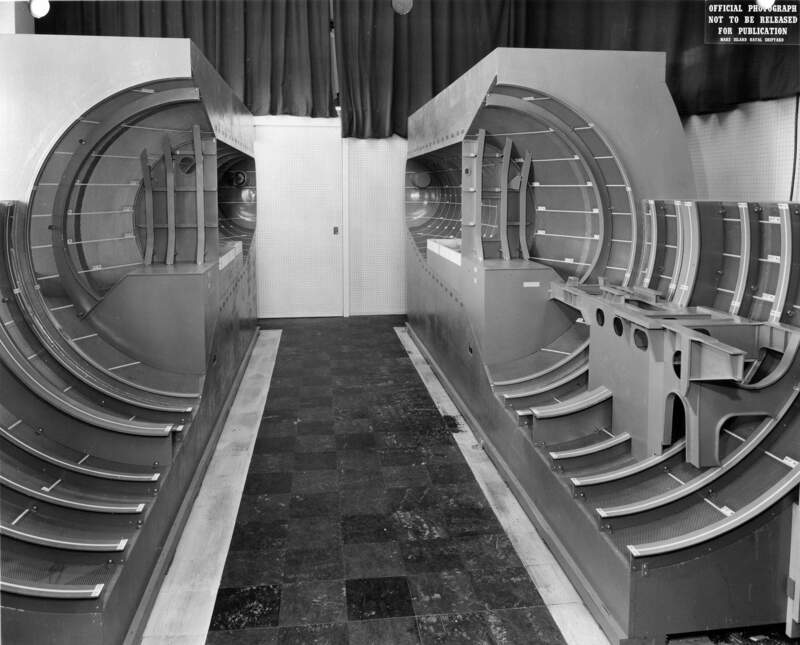 629k Early design ¼ scale model of Halibut (SSGN-587) weapons hangar (without weapons loading hatch) looking aft from the area of the forward torpedo tubes, 19 February 1957. USN photo # 33123-2-57, courtesy of Darryl L. Baker. 764k ¼ scale model of Halibut (SSGN-587) weapons hangar and forward compartment from ~ frame 70 looking forward. 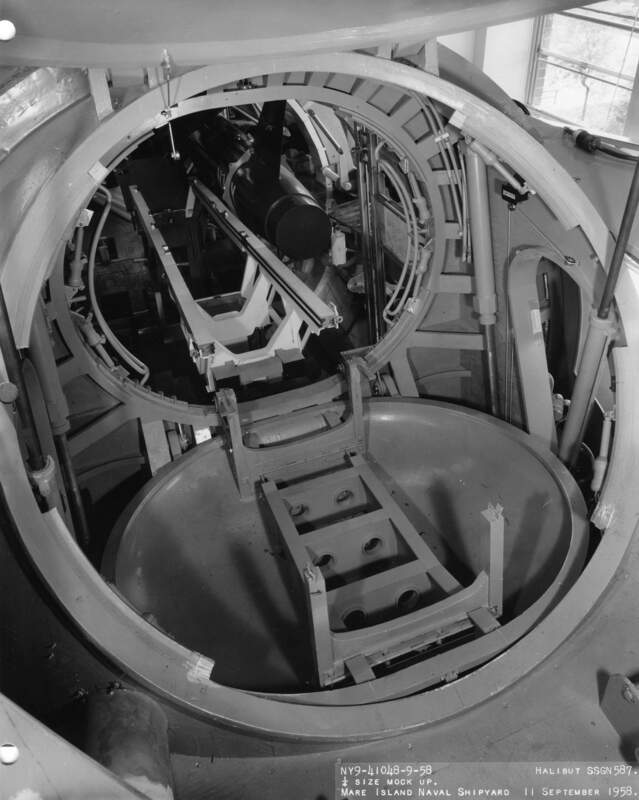 Note: Passage between forward compartment and weapons loading hatch above, March 1957. USN photo # 33425-3-57, courtesy of Darryl L. Baker. 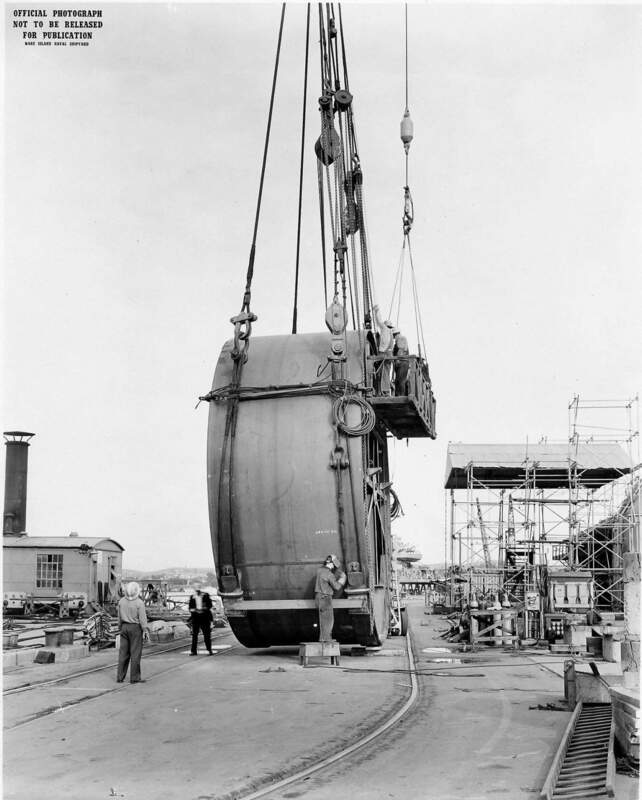 217k Hull section #4 for the Halibut (SSGN-587) is being prepared for lifting by YD-33 at Mare Island's berth 15 and moved to the building ways on 15 March 1957. USN photo # 34302-5-57, courtesy of Darryl L. Baker. 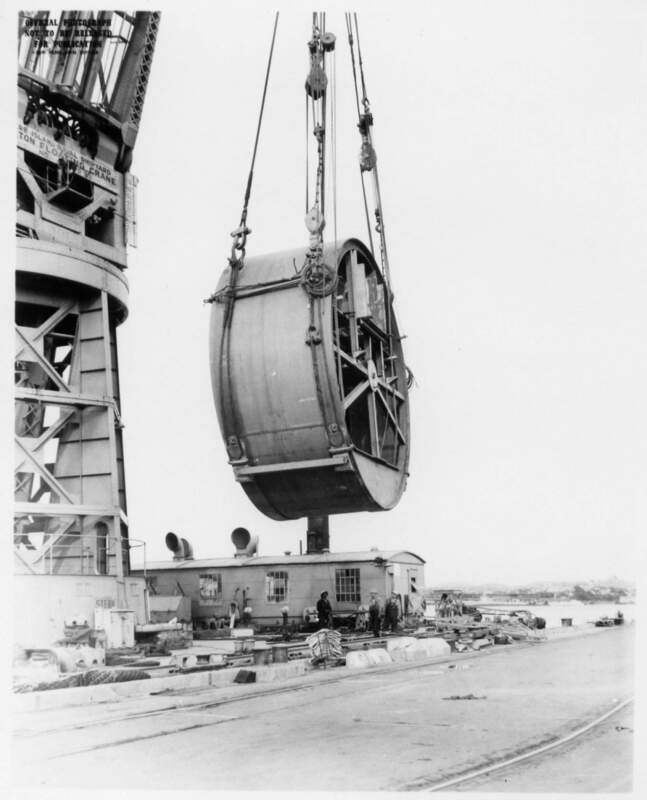 137k Hull section #4 for the Halibut (SSGN-587) is being lifted by YD-33 at Mare Island's berth 15 and moved to the building ways on 15 March 1957. USN photo # 343045-57, courtesy of Darryl L. Baker. 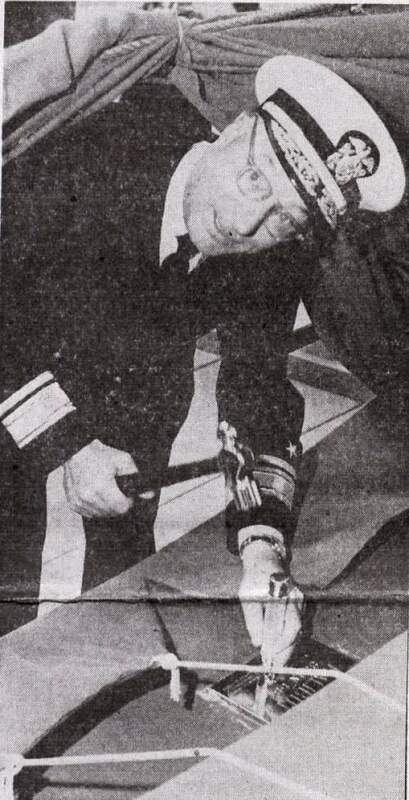 88k RADM Martin J. Lawrence authenticated the keel of the Halibut (SSGN-587) on 11 April 1957 at Mare Island as seen in this news clipping. USN photo courtesy of Darryl L. Baker. 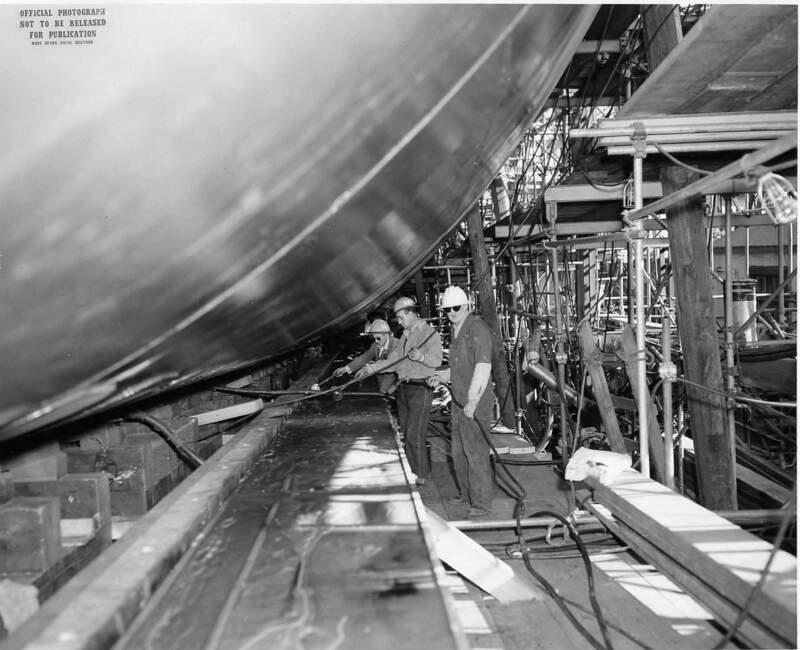 299k General view of the keel laying ceremonies for Halibut (SSGN-587) at Mare Island on 11 April 1957. USN photo # 33878-4-57, courtesy of Darryl L. Baker. 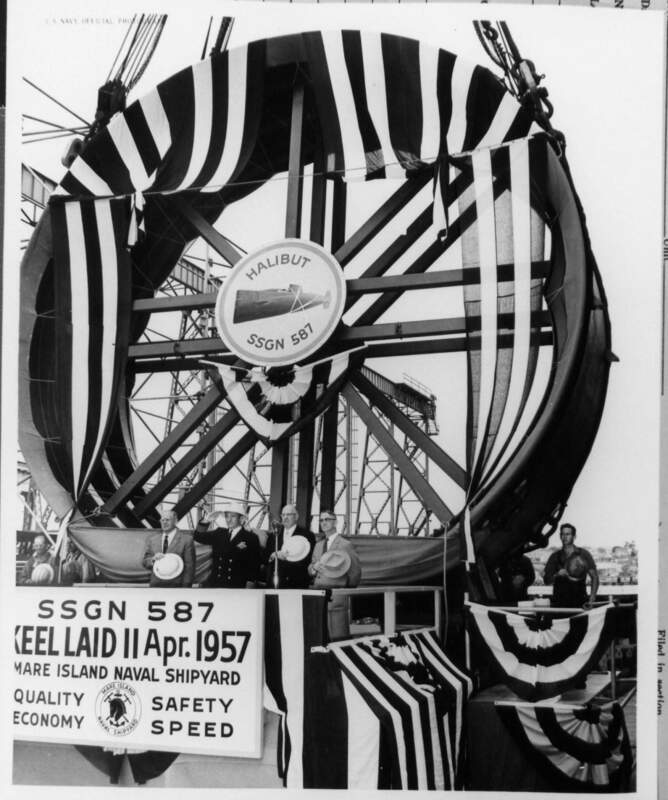 70k A news clipping showing the scene at Mare Island Naval Shipyard on 11 April1957 during the keel laying of the Halibut (SSGN-587). 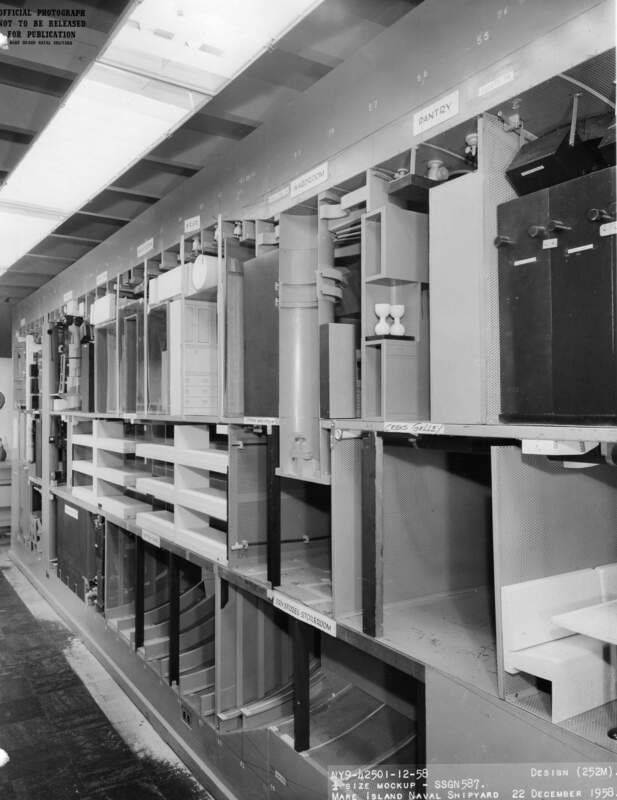 The large arrow on the left is pointing to a model of the Regulus missile. USN photo courtesy of Darryl L. Baker. 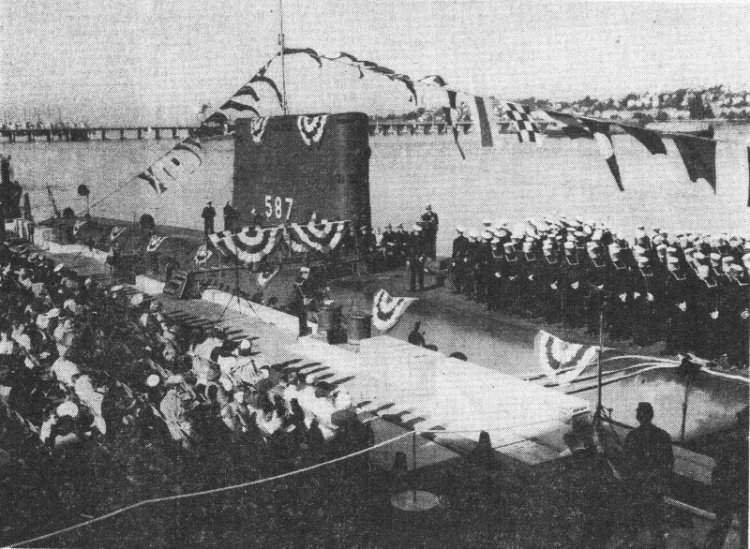 192k Honorary keel layers of the Halibut (SSGN-587) stand at attention on 11 April1957 at Mare Island while the national anthem is played. On the platform, left to right, are I. H. Witthonrne, pipe shop master; Capt. 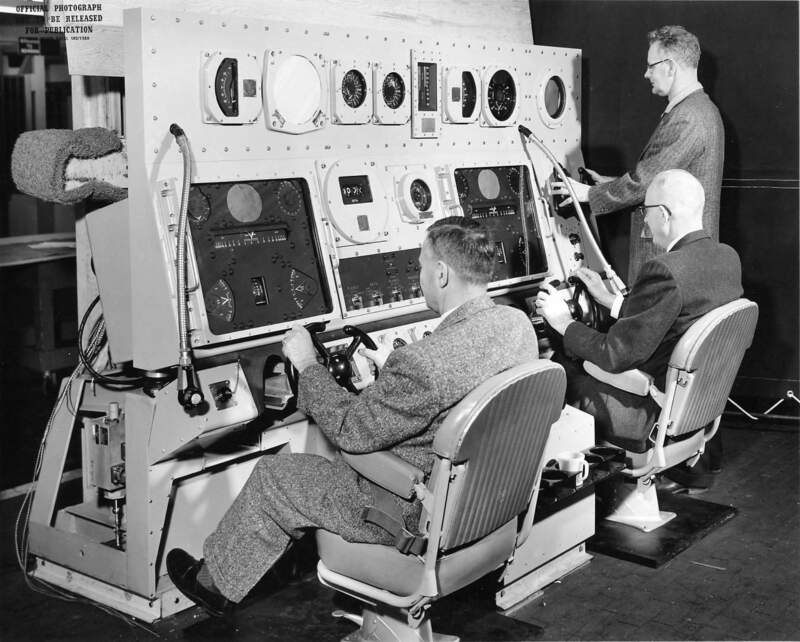 Edward J. Fahy, production officer; George K. O 'Hara, master electronics mechanic, and Ross Gibbons, retired chief engineer. USN photo # 338883-4-57, courtesy of Darryl L. Baker. 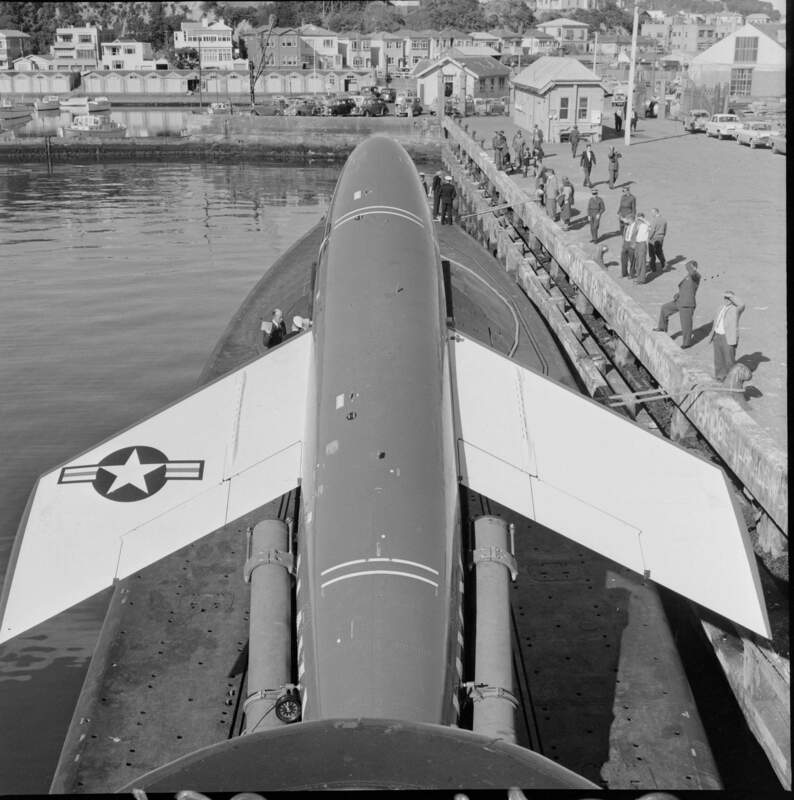 659k Regulus II missile is seen on launcher on ¼ scale model of Halibut (SSGN-587), 17 April 1957. USN photo # 33797-4-57, courtesy of Darryl L. Baker. 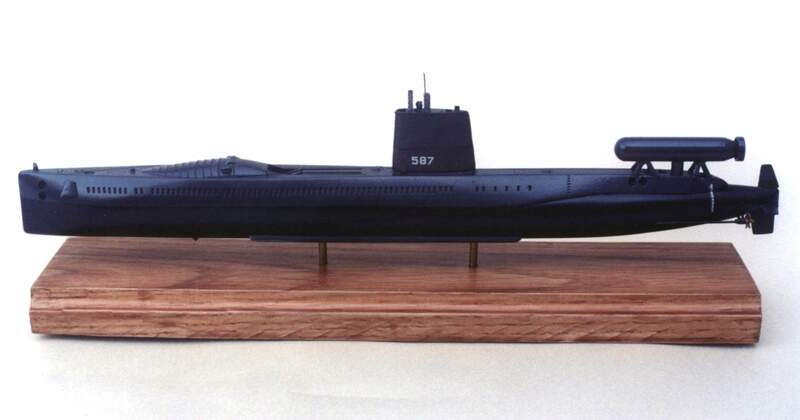 1.2m ¼ scale model of Halibut (SSGN-587) after compartments from ~ frame 109 to 135, June 1957. USN photo # 34644-6-57, courtesy of Darryl L. Baker. 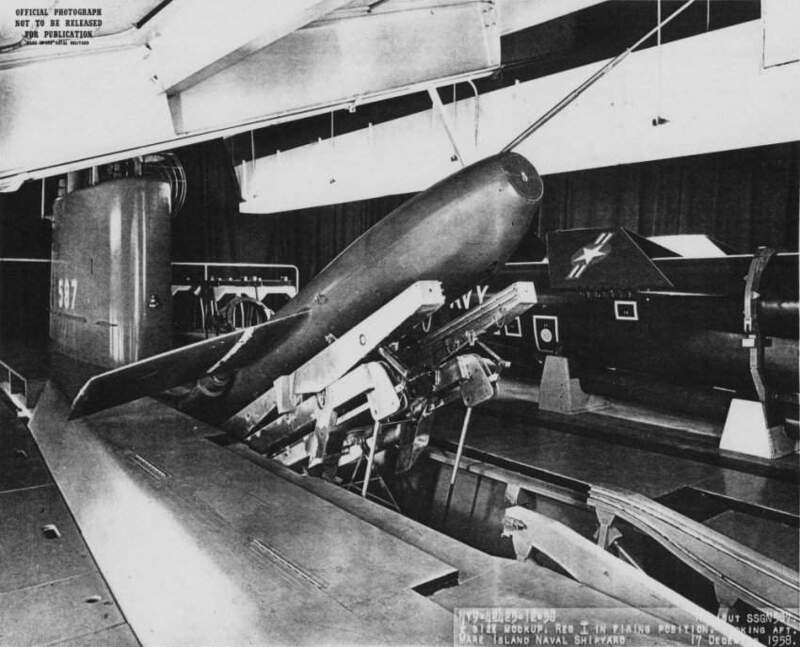 743k Regulus II missiles and torpedo stowage as seen on ¼ scale model of Halibut (SSGN-587), looking forward from weapons loading hatch, July 1957. USN photo # 35199-7-57, courtesy of Darryl L. Baker. 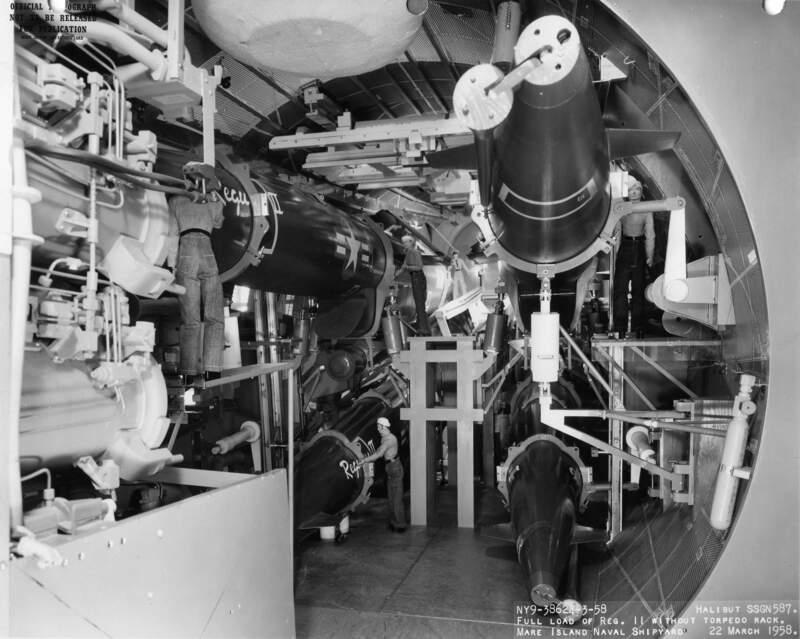 727k Regulus II missiles stowage as seen on ¼ scale model of Halibut (SSGN-587) looking aft from area of torpedo tubes, July 1957. USN photo # 35200-7-57, courtesy of Darryl L. Baker. 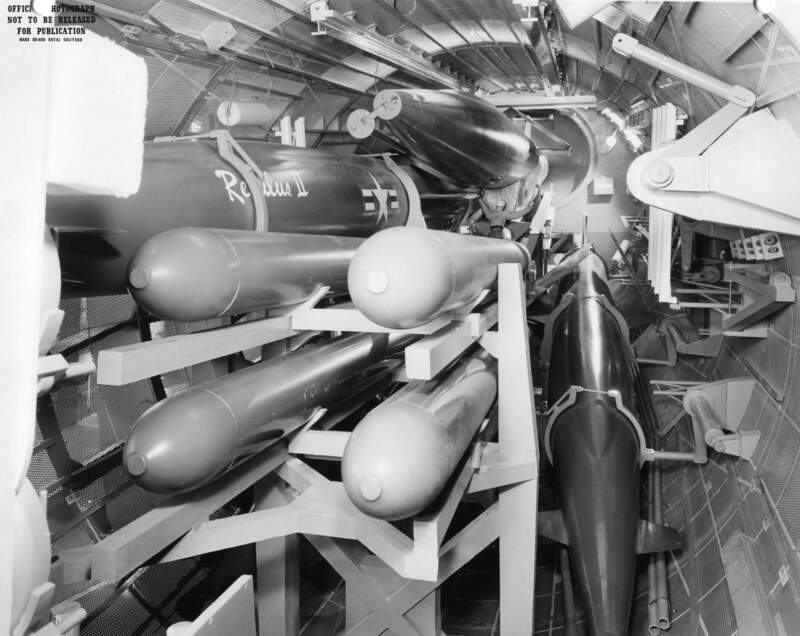 921k Regulus II missiles and torpedo stowage as seen on ¼ scale model of Halibut (SSGN-587) looking aft from area of torpedo tubes, July 1957. USN photo # 35207-7-57, courtesy of Darryl L. Baker. 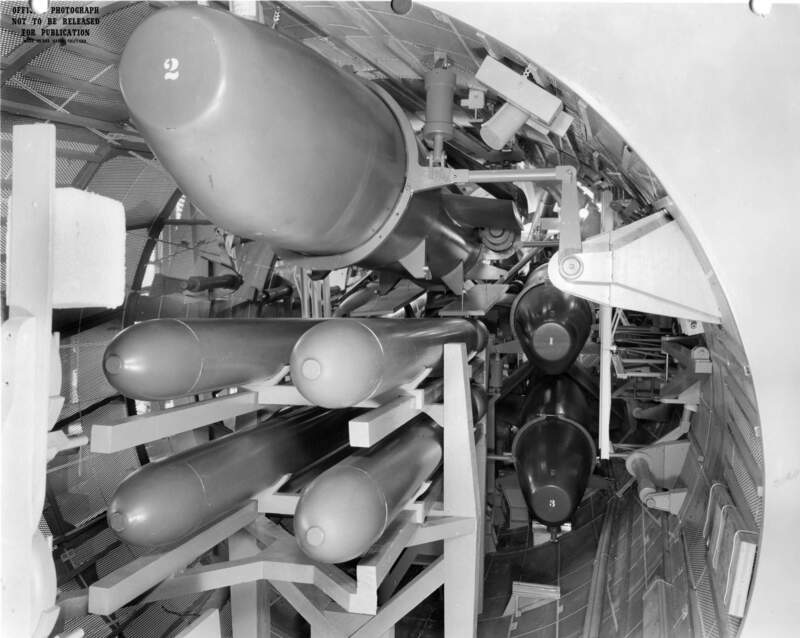 869k Regulus I missiles and torpedo stowage as seen on ¼ scale model of Halibut (SSGN-587) looking aft from area of torpedo tubes, July 1957. USN photo # 35283-7-57, courtesy of Darryl L. Baker. 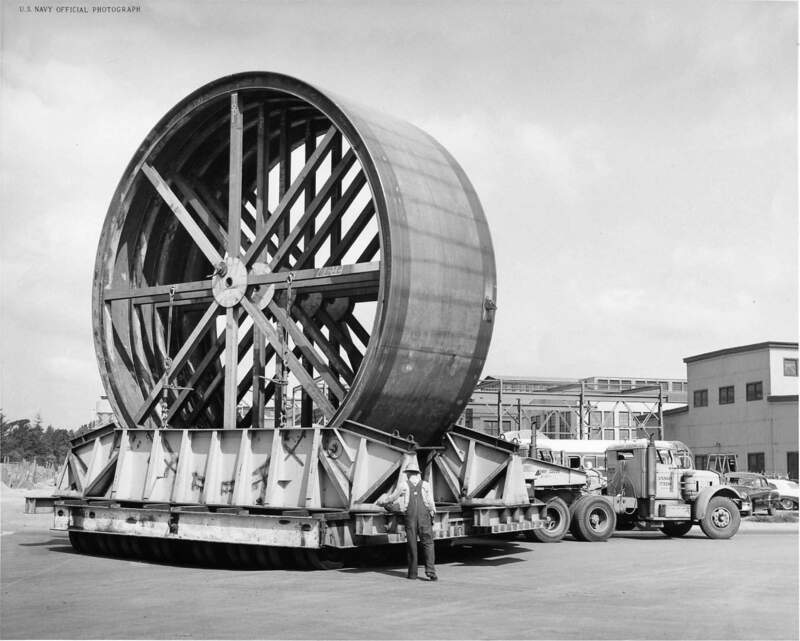 146k Forward hull section of Halibut (SSGN-587) is being moved via a 85 ton trailer and dual tractors from the structural shop to the building ways at Mare Island in September 1957. USN photo # 36576-9-57, courtesy of Darryl L. Baker. 477k Shipyard built model of Halibut (SSGN-587) dated 18 November 1957. USN photo # 37401-11-57, courtesy of Darryl L. Baker. 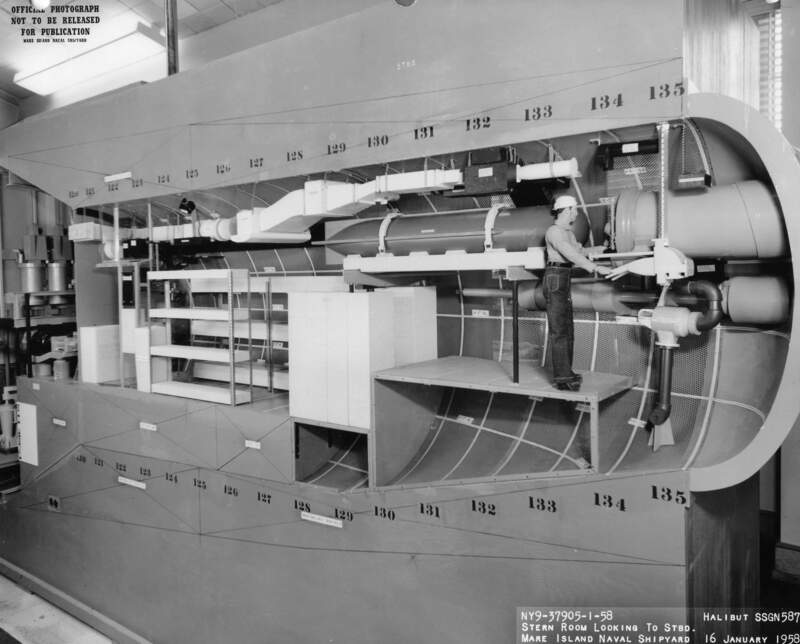 736k ¼ scale model of Halibut (SSGN-587) stern torpedo room port side frame 135 to 118 looking forward, 1/16/1958. USN photo # 37905-1-58, courtesy of Darryl L. Baker. 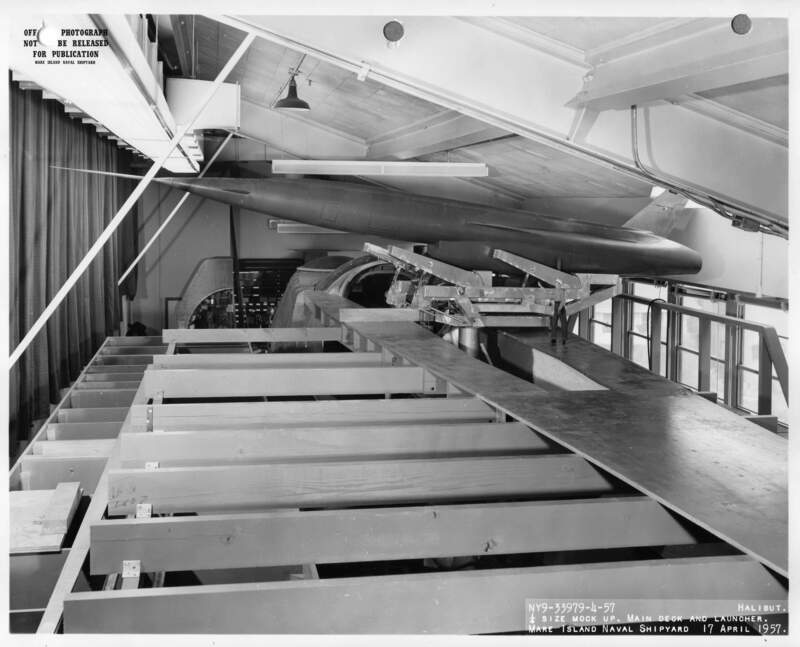 881k ¼ scale model of Halibut (SSGN-587) stern torpedo room starboard side frame 135 to 118 looking forward, 1/16/1958. USN photo # 37906-1-58, courtesy of Darryl L. Baker. 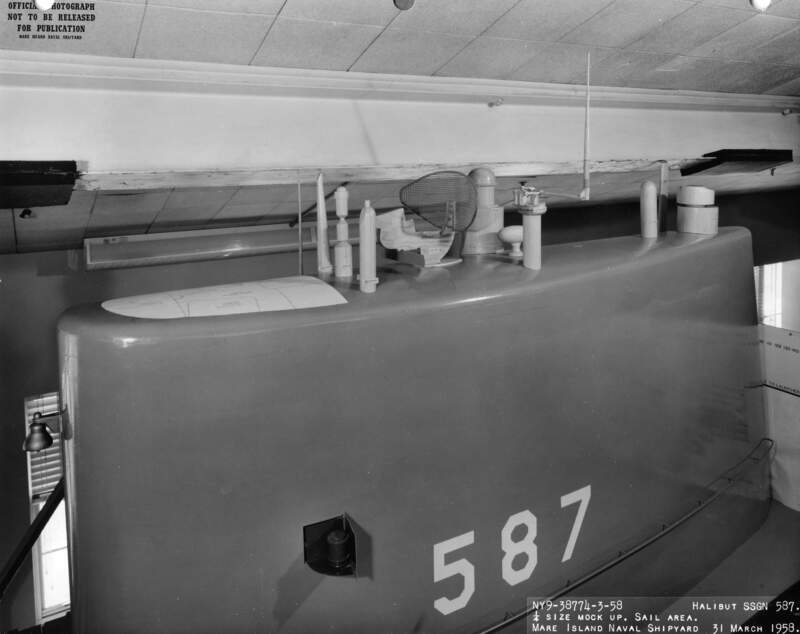 554k ¼ scale model of Halibut (SSGN-587) mast arrangement, 3/31/58. USN photo # 38774-3-58, courtesy of Darryl L. Baker. 405k Shipyard built model of Halibut (SSGN-587) dated 26 February 1958. USN photo # 38257-2-58, courtesy of Darryl L. Baker. 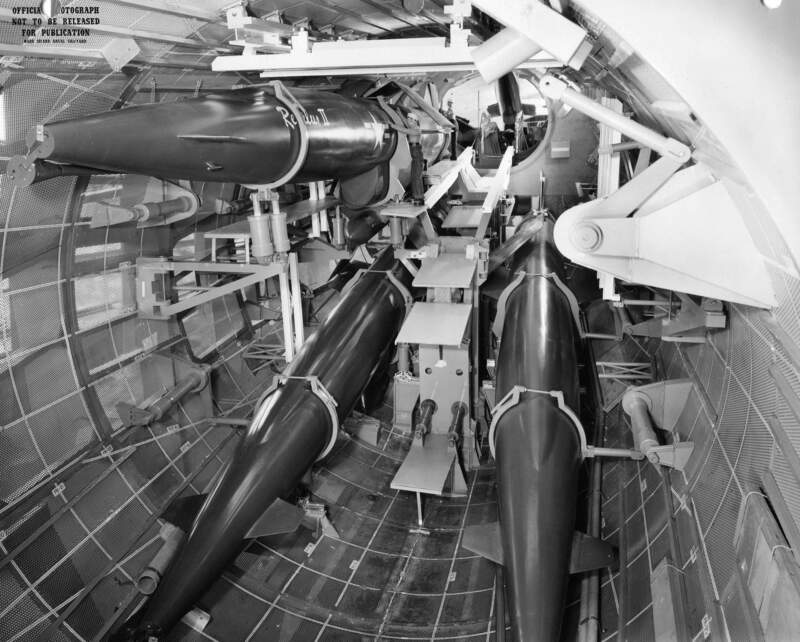 918k Regulus II missiles and without torpedo stowage as seen on ¼ scale model of Halibut (SSGN-587), looking aft from area of torpedo tubes. Note: Torpedo tube details, 22 March 1958. USN photo # 38624-3-58, courtesy of Darryl L. Baker. 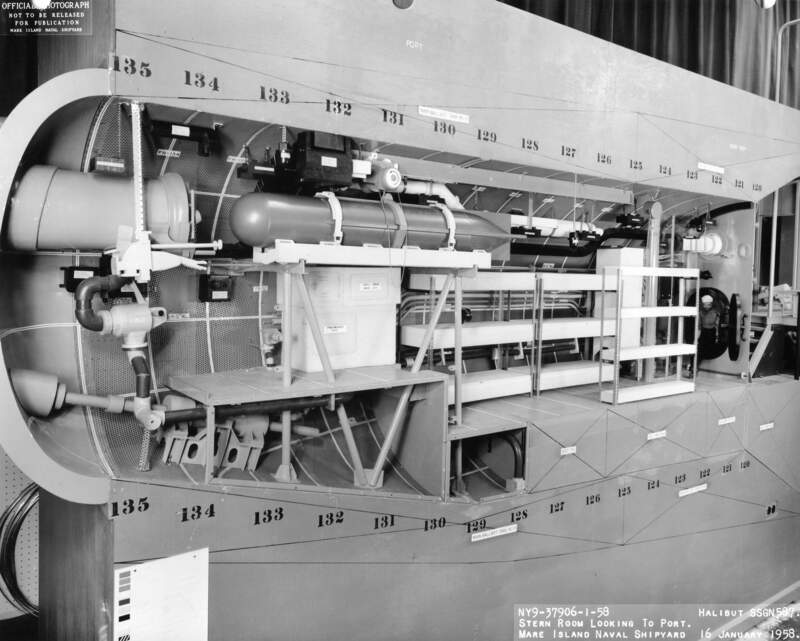 705k Weapons loading hatch details on ¼ scale model of Halibut (SSGN-587), looking forward, 11 September 1958. USN photo # 41048-9-58, courtesy of Darryl L. Baker. 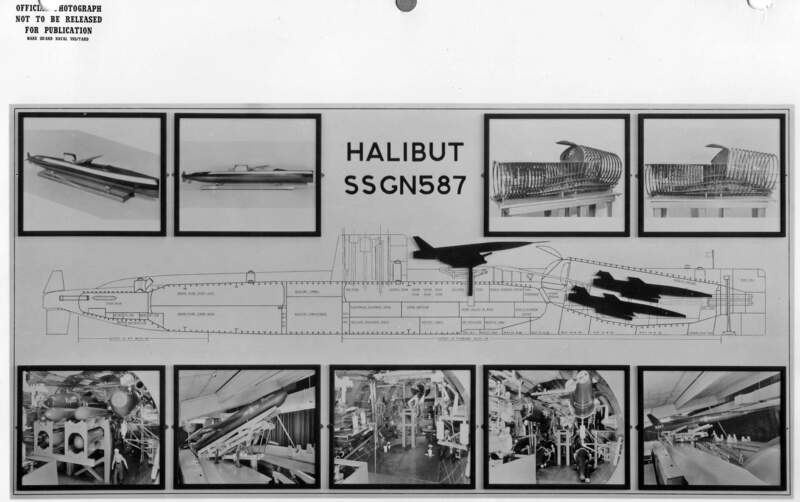 630k Poster showing the hull/tank outline of Halibut (SSGN-587) dated March 1958. Areas modeled by the shipyard are noted. 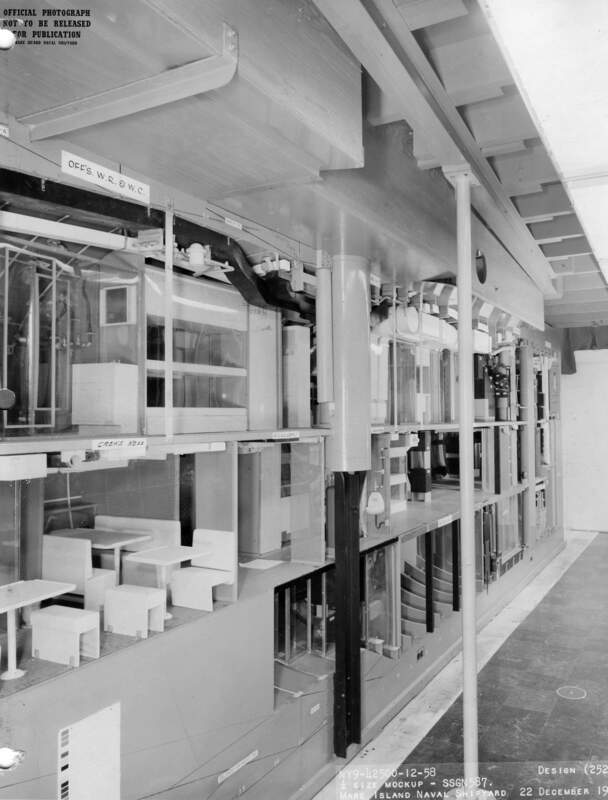 The engineering spaces were modeled by Electric Boat. USN photo # 38771-3-58, courtesy of Darryl L. Baker. 745k First a word on Project Lehi – This project task was to design the prototype of the Halibut (SSGN-587) Regulus II missile storage and handling system. She was to become the Regulus II test and training ship and home ported out of Point Mugu. 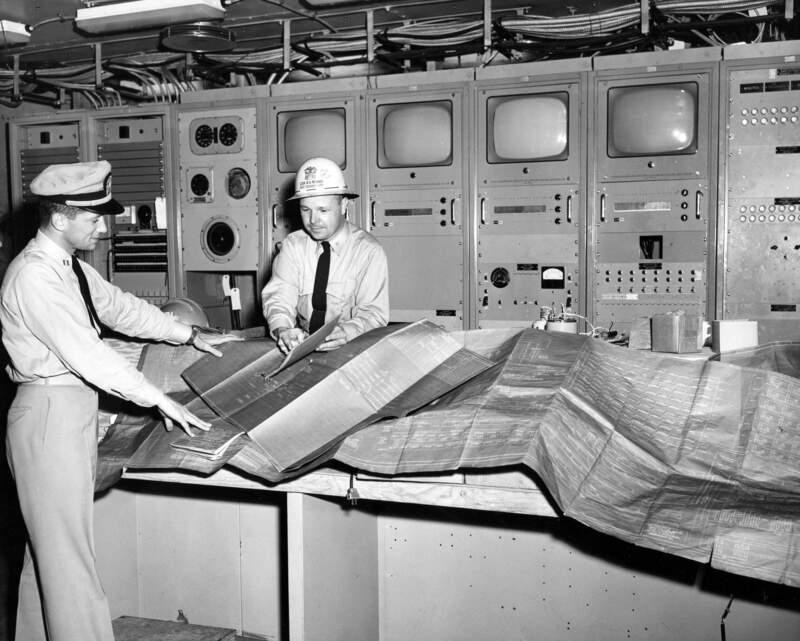 LT J. Metcalf Officer-in-Charge of the King County (AG-157), left, is looking over the plans for the Regulus II missile system with LCDR R. G. Newby, Mare Island's Assistant Design Superintend on 18 September 1958. Photo courtesy of the Vallejo Naval and Historical Museum via Darryl L. Baker. 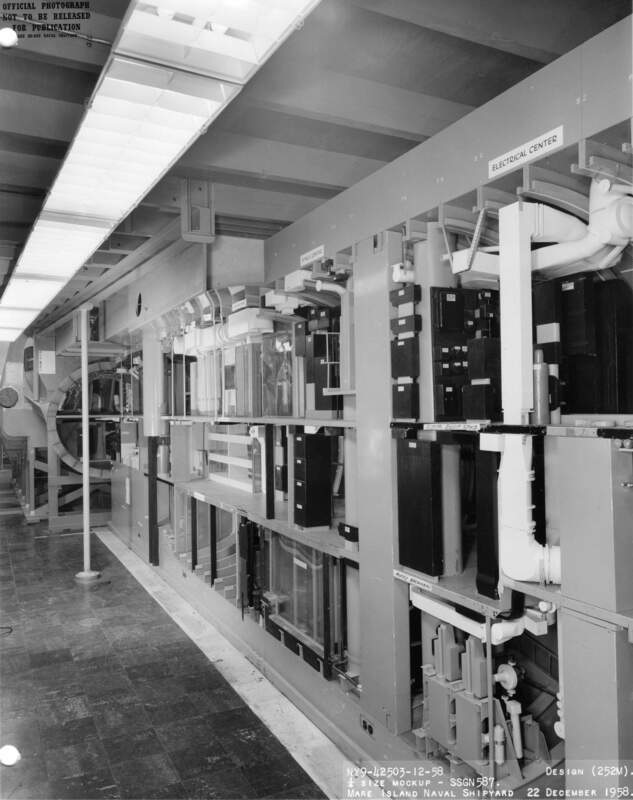 928k The prototype Regulus II storage and handling system in being installed aboard the King County (AG-157) at Mare Island on 18 September 1958. Note the submarine sail. Photo courtesy of the Vallejo Naval and Historical Museum via Darryl L. Baker. 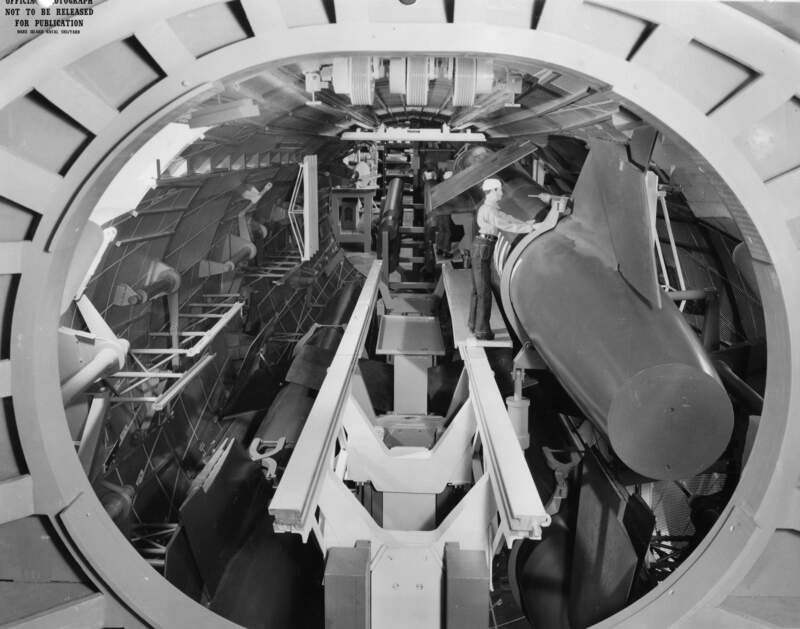 756k A view of the topside mock-up of the Halibut's (SSGN-587) topside missile launching area aboard the King County (AG-157) on 18 September 1958. I’m not sure safety was happy with the temporary support of the Bat Cave hatch. Photo courtesy of the Vallejo Naval and Historical Museum via Darryl L. Baker. 224k A forward hull section of the then (SSBN-600) arrives at the building ways at Mare Island on 22 September 1958. The bow of the Halibut (SSGN-587) is to the right. USN photo # 41183-9-58, courtesy of Darryl L. Baker. 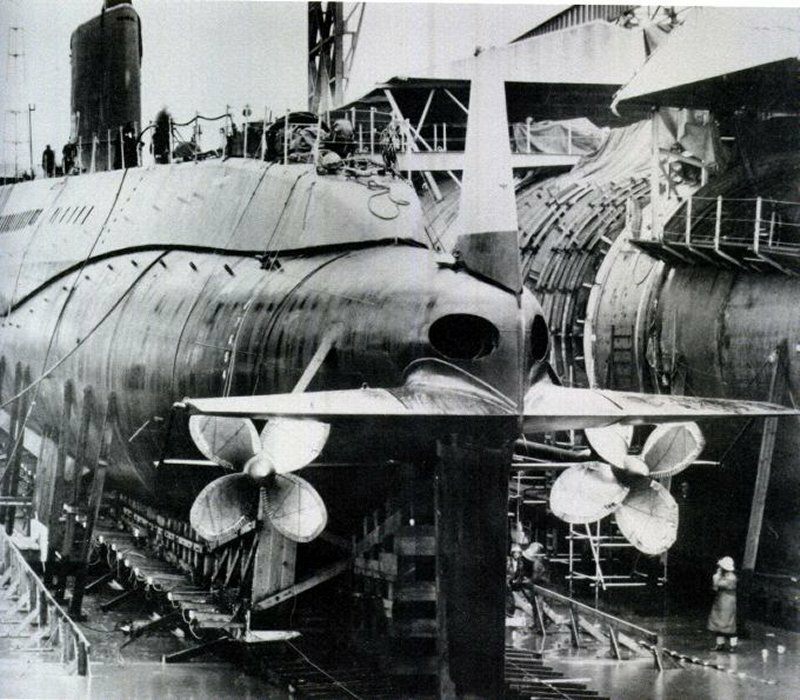 46k X64 getting the ways ready for Halibut's (SSGN-587) launching in 1958. USN photo # (MINSY Photo 42058-11-58) courtesy of Darryl L. Baker. 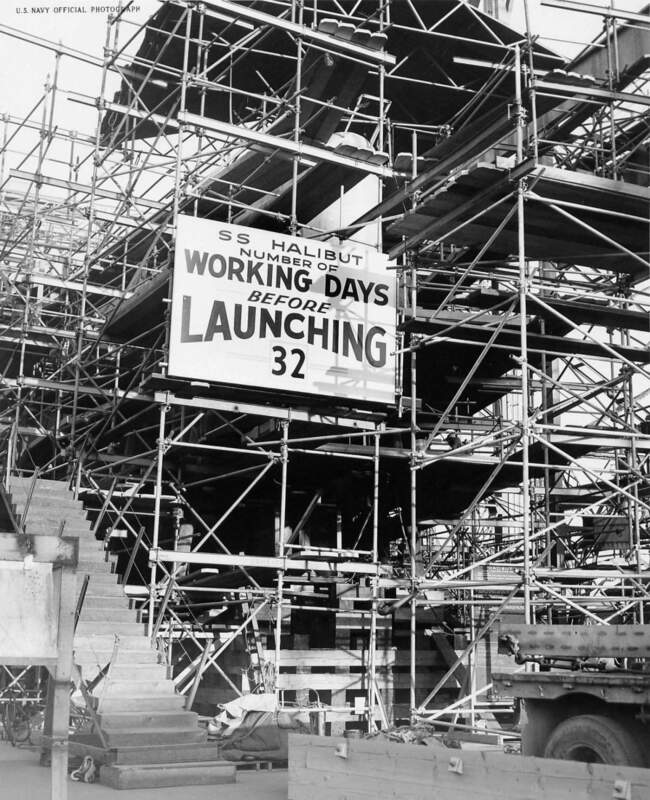 > 299k Sign at the head of building ways for Halibut (SSGN-587) at Mare Island on 17 November 1958 announcing that there are only 32 production days remaining to launch date. USN photo # 42042-11-58, courtesy of Darryl L. Baker. 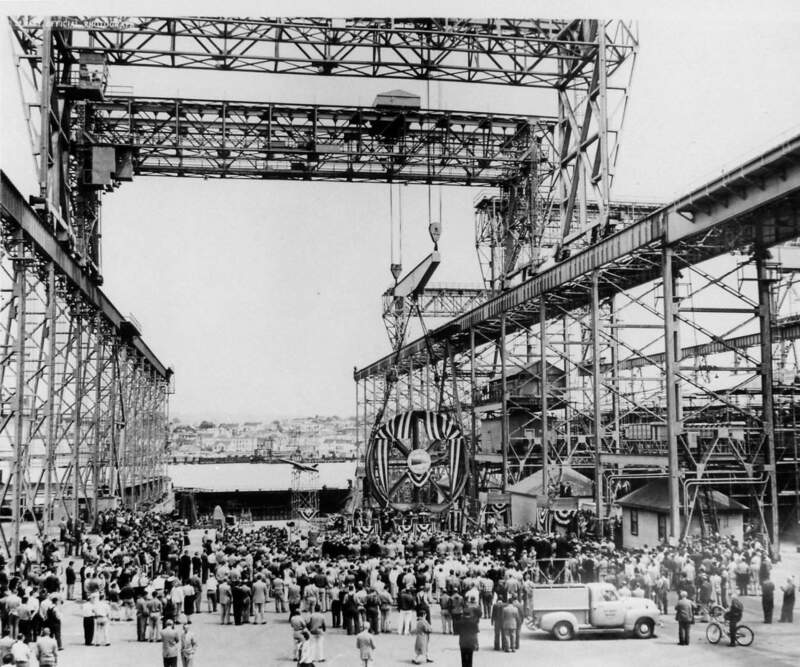 > 156k Workers making preparation for the launching of Halibut (SSGN-587) at Mare Island in November 1958. USN photo # 42058-11-58, courtesy of Darryl L. Baker. 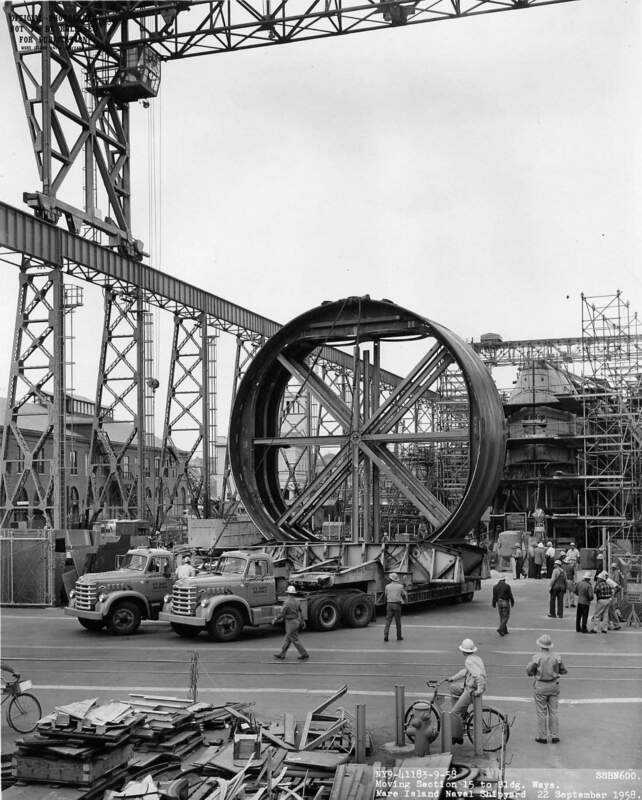 > 151k Aft section of the launching cradle for Halibut (SSGN-587) as seen at Mare Island in November 1958. USN photo # 42059-11-58, courtesy of Darryl L. Baker. 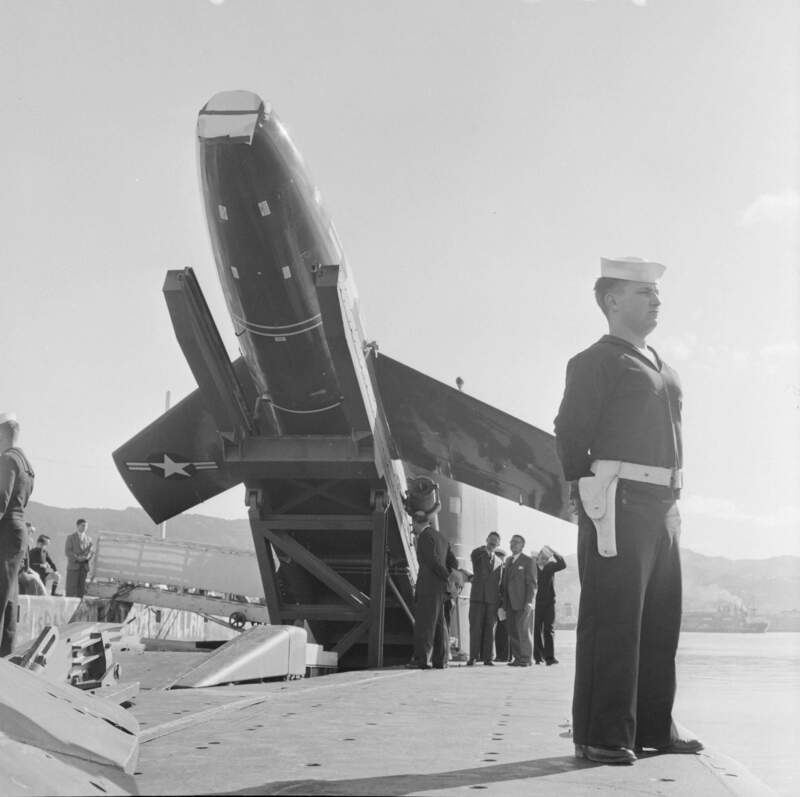 > 70k ¼ scale mock-up of a Regulus missile in firing position aboard the Halibut (SSGN-587), dated 12/17/1958. USN photo # NY9-42425-12-58, courtesy of Darryl L. Baker. > 783k ¼ scale model of Halibut (SSGN-587) midships section from frame 53 to 84 looking aft on starboard side, 12/22/58. USN photo # 42500-12-58, courtesy of Darryl L. Baker. 912k ¼ scale model of Halibut (SSGN-587) midships section from frame 53 to 84 looking aft on port side, 12/22/58. USN photo # 42501-12-58, courtesy of Darryl L. Baker. 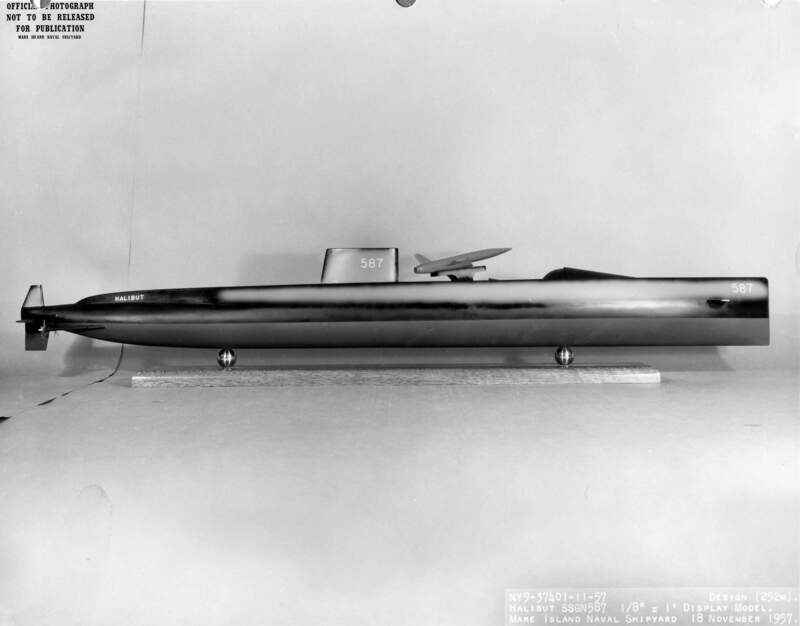 722k ¼ scale model of Halibut (SSGN-587) midships section from frame 85 to 53 looking forward on port side, 12/22/58. USN photo # 42502-12-58, courtesy of Darryl L. Baker. 796k ¼ scale model of Halibut (SSGN-587) midships section from frame 85 to 53 looking forward on starboard side, 12/22/58. USN photo # 42503-12-58, courtesy of Darryl L. Baker. 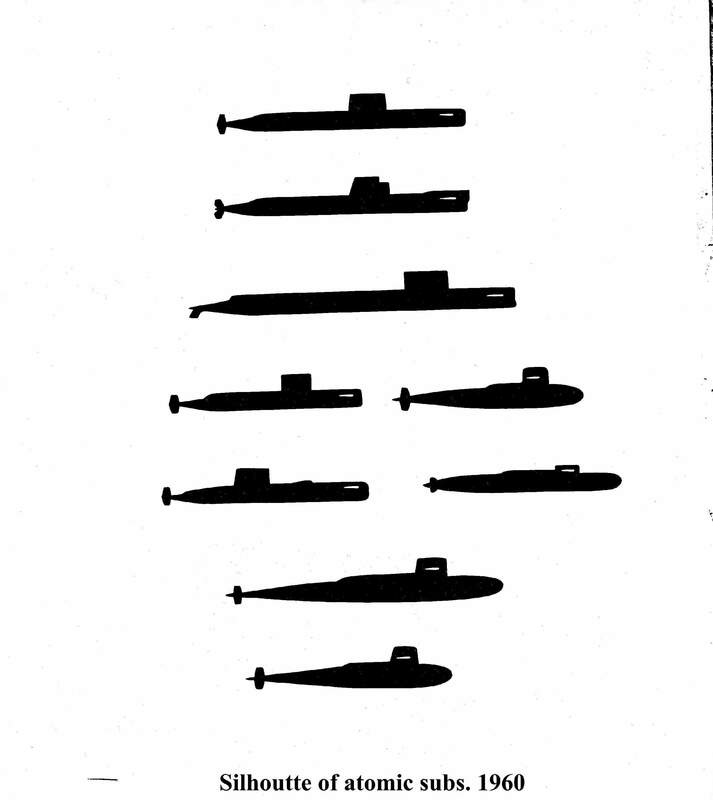 171k Nuclear submarine lineup depicting the current 19 different types. USN photo courtesy of Scott Koen & ussnewyork.com. 89k The Halibut (SSGN-587) on the building ways at Mare Island. Note that the ship is on an incline and there are rails under the launch cradle (wooden blocking). This picture was taken in the early morning shortly before her launching. The five vertical supports on the left would removed before launching. The keel of the Theodore Roosevelt (SSGN-600) is seen on the ways to the right of Halibut. USN photo courtesy of Nick Spark. Text courtesy of Darryl L. Baker. 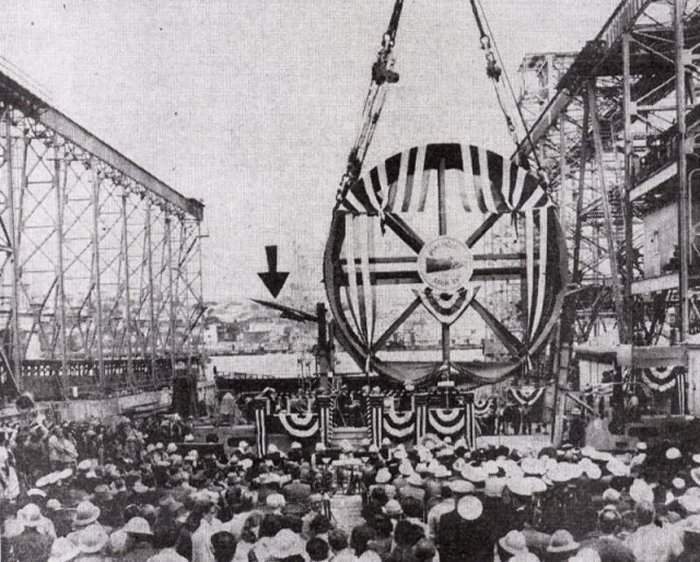 556k Workmen check out the Halibut (SSGN-587) before her launching at Mare Island on 9 January 1959. Photo courtesy of Scott Koen & ussnewyork.com. 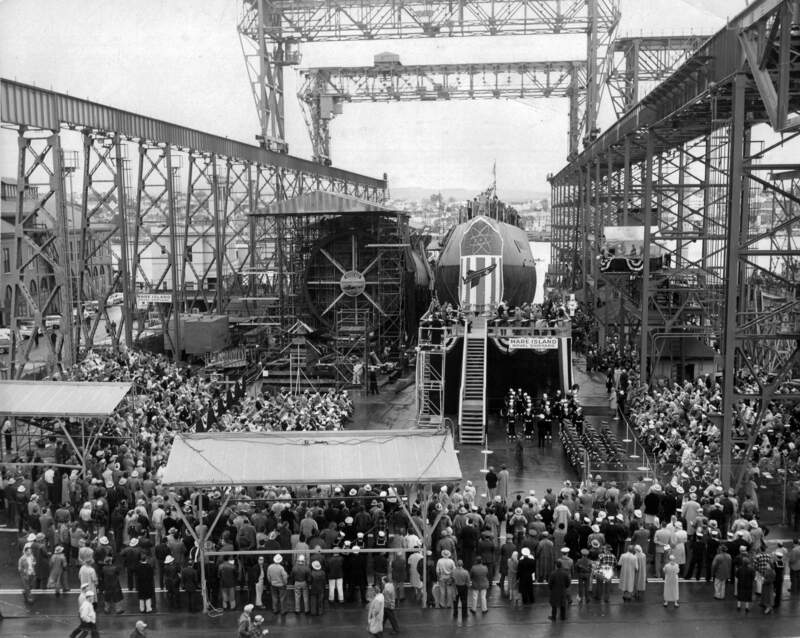 284k The boat riders are in place (hurry-up and wait for the VIPs) for the launching of Halibut (SSGN-587) at Mare Island on 9 January 1959. The hull of the Theodore Roosevelt (SSGN-600) is seen on the ways to the left of Halibut. USN photo # 42661-1-59, courtesy of Darryl L. Baker. 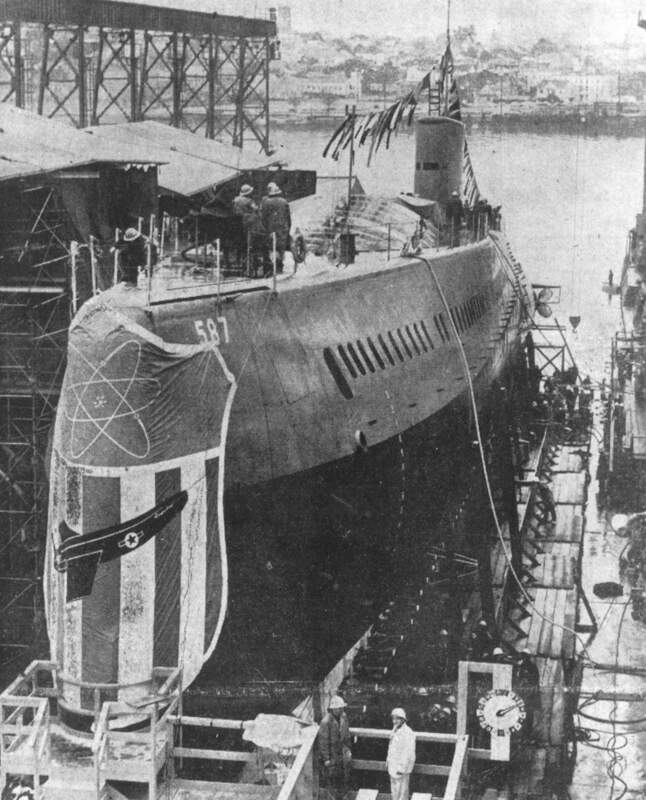 1.40k The Halibut (SSGN-587) is ready for her launching at Mare Island Naval Shipyard on 9 January 1959. The keel of the Theodore Roosevelt (SSGN-600) is seen on the ways to the left of Halibut. USN photo # 42608-1-59 courtesy of Darryl L. Baker. 138k The Halibut (SSGN-587) is seen just prior to her launching at Mare Island Naval Shipyard on 9 January 1959. 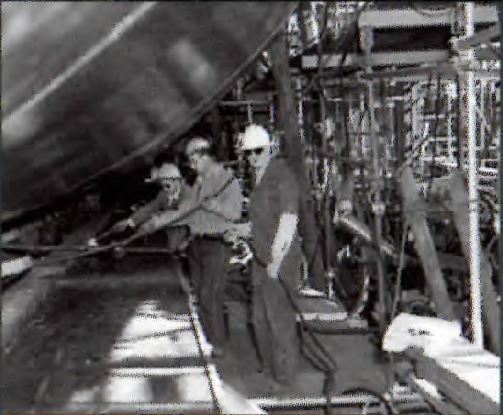 The keel of the Theodore Roosevelt (SSGN-600) is on the ways to the right. USN photo # NY9-42606-1-59, courtesy of Darryl L. Baker. 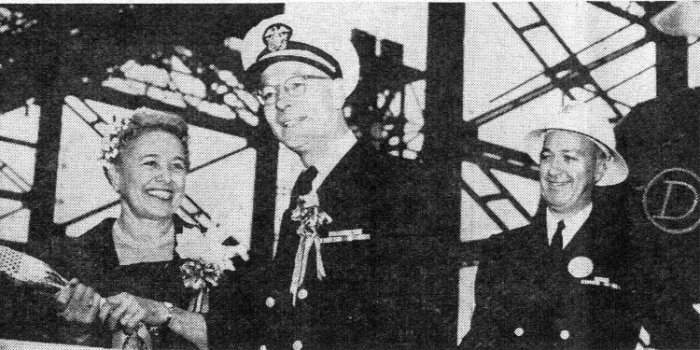 641k Photo of Mrs. Chet Holifield (sponsor) and RADM Martin Lawrence (Shipyard Commander) for the Halibut (SSGN-587) at Mare Island on 9 January 1959. USN photo # 42661-1-59, from the files of the Vallejo Naval & Historical Museum, courtesy of Darryl L. Baker. 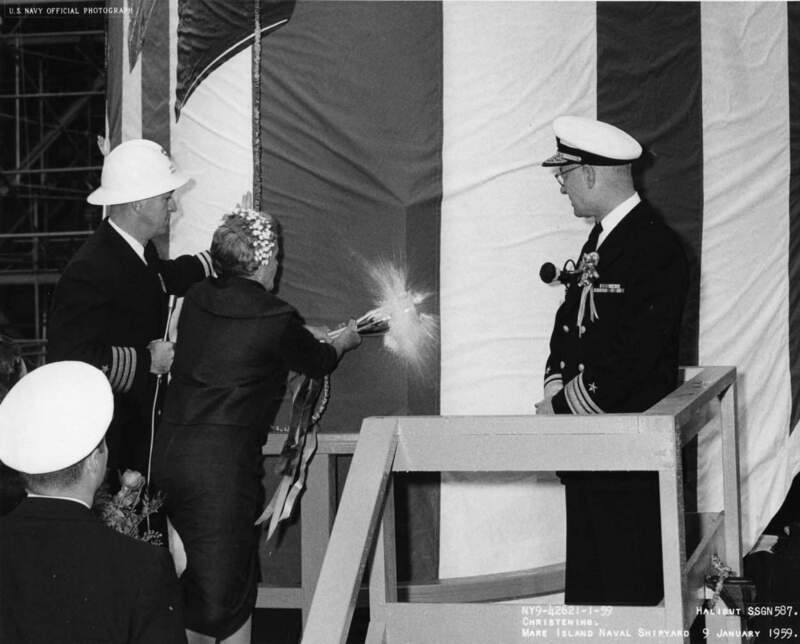 103k Mrs. Chet Holifield, sponsor, christens the Halibut (SSGN-587) at Mare Island on 9 January 1959. Assisting Mrs. Holifield are Capt E. R. Tilburne, production officer is on the left and RADM M. J. Lawrence, shipyard commander is on the right. USN photo # 42621-1-59, courtesy of Darryl L. Baker. 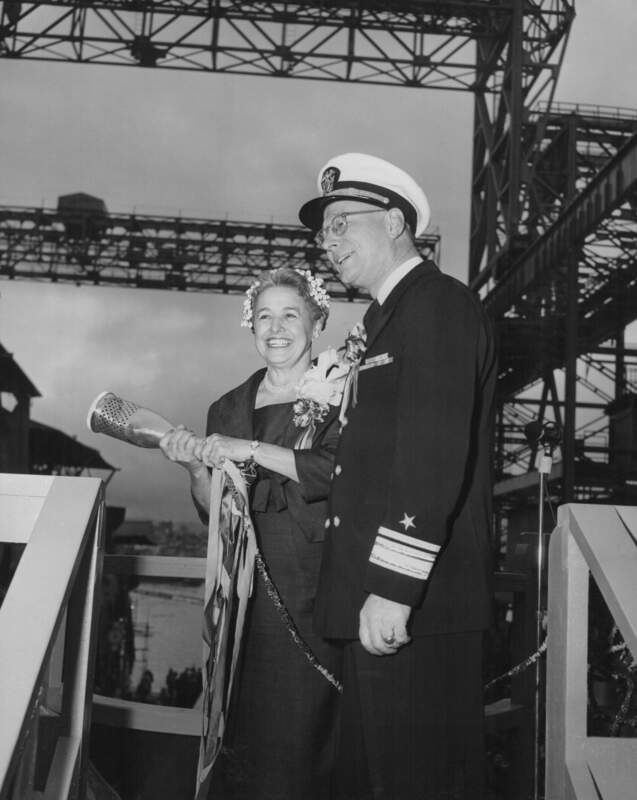 44k Mrs. Chet Holifield, sponsor, is shown with the bottle on champagne to be used to christen the Halibut (SSGN-587) at Mare Island on 9 January 1959. RADM M. J. Lawrence, shipyard commander is shown center and Capt E. R. Tilburne, production officer is on the right. USN photo courtesy of Darryl L. Baker. 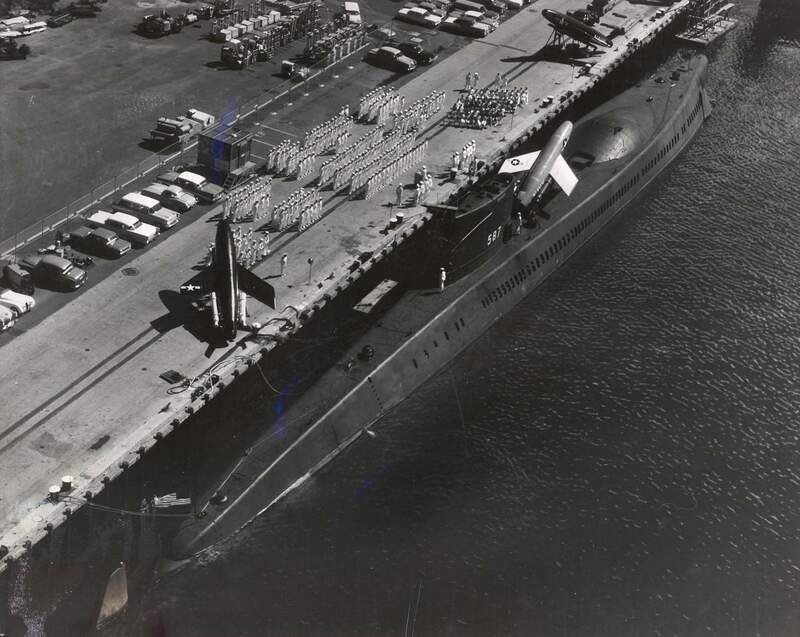 990k Nice bow shot of the Halibut (SSGN-587) being launched at Mare Island on 9 January 1959. Photo courtesy of the Vallejo Naval and Historical Museum via Darryl L. Baker. 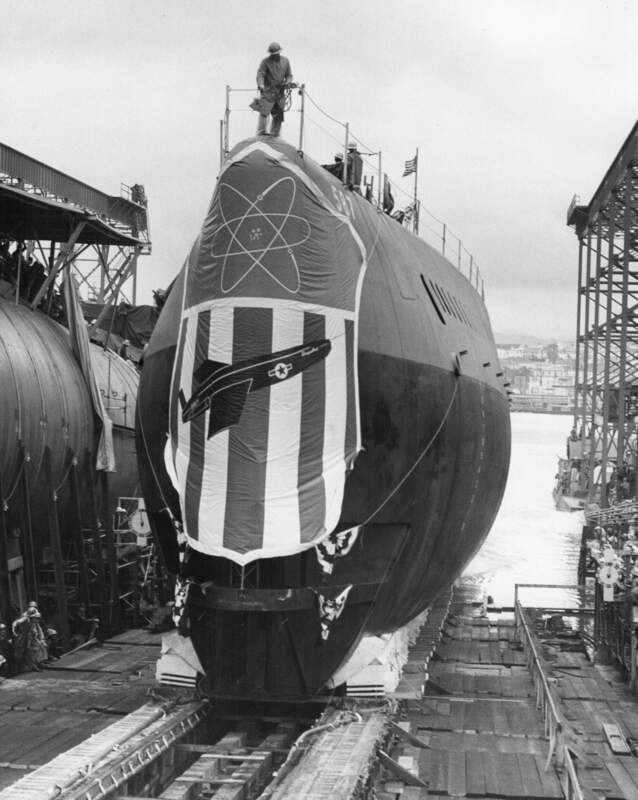 1.10k The Halibut (SSGN-587) is at the end of ways during her launching at Mare Island on 9 January 1959. Theodore Roosevelt (SSGN-600) is on the ways to the left. 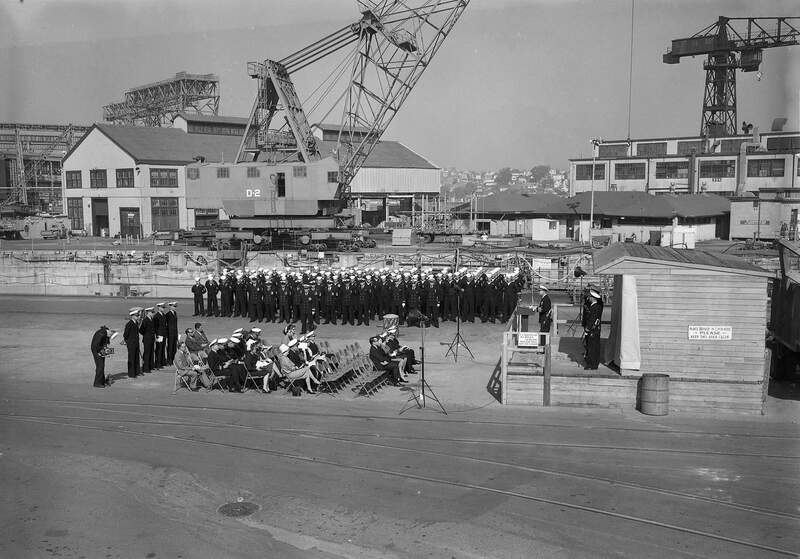 Navy Photo # 42623-1-59, courtesy of the Vallejo Naval and Historical Museum via Darryl L. Baker. 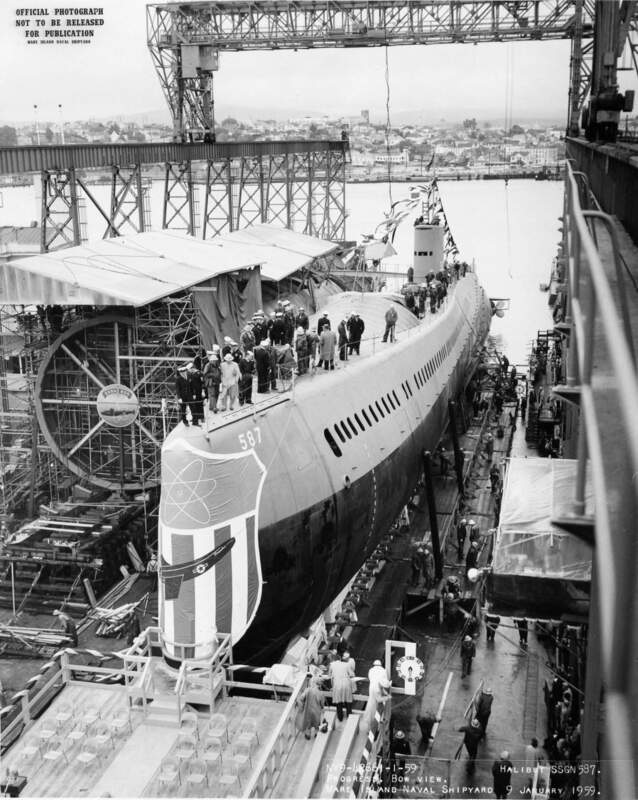 895k The Halibut (SSGN-587) is about totally waterborne at her launching at Mare Island on 9 January 1959. USN photo # 42625-1-59,courtesy of the Valllejo Naval and Historical Museum. Photo contributed by Darryl L. Baker. 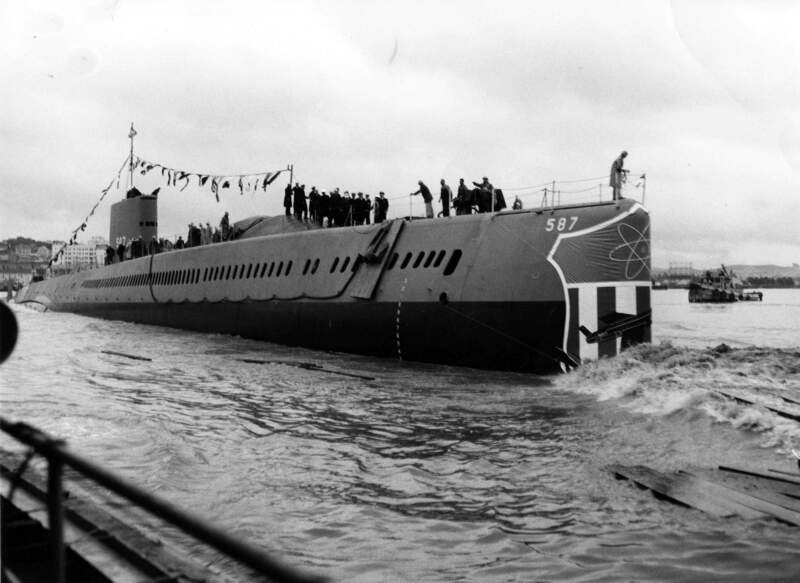 1.37k Official launching part at a reception after the launching of the Halibut (SSGN-587) at Mare Island on 9 January 1959. USN photo # 42636-1-59 from the files of the Vallejo Naval & Historical Museum, courtesy of Darryl L. Baker. 217k 3 page PDF of the Launching Program of the Halibut (SSGN-587) at Mare Island on 9 January 1959. USN photos courtesy of Darryl L. Baker. 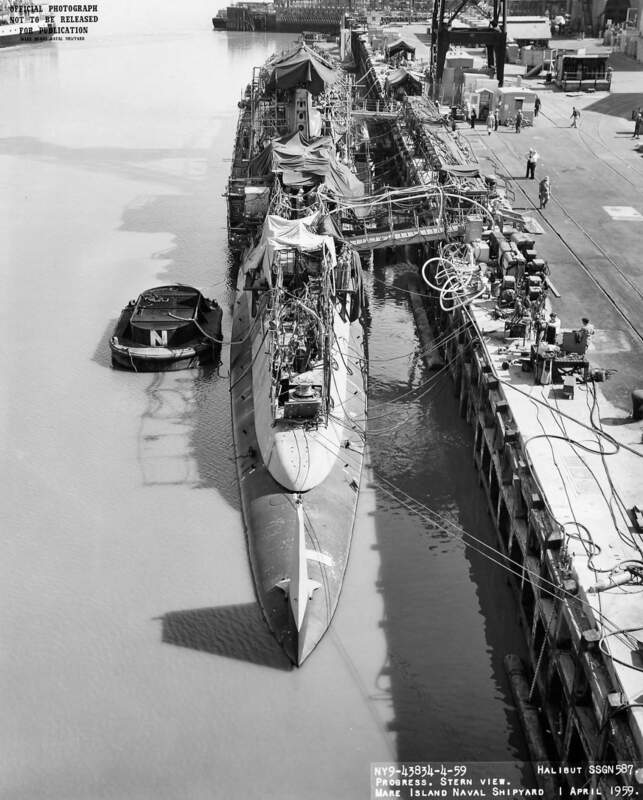 723k Halibut (SSGN-587) entering dry dock #2 at Mare Island to drop her launch cradle after her launching on 9 January 1959. Photo courtesy of the Vallejo Naval and Historical Museum via Darryl L. Baker. 61k The Halibut (SSGN-587) is seen in dry dock #2 sometime between 13 January 1959 and 24 February 1959. USN photo courtesy of Darryl L. Baker. 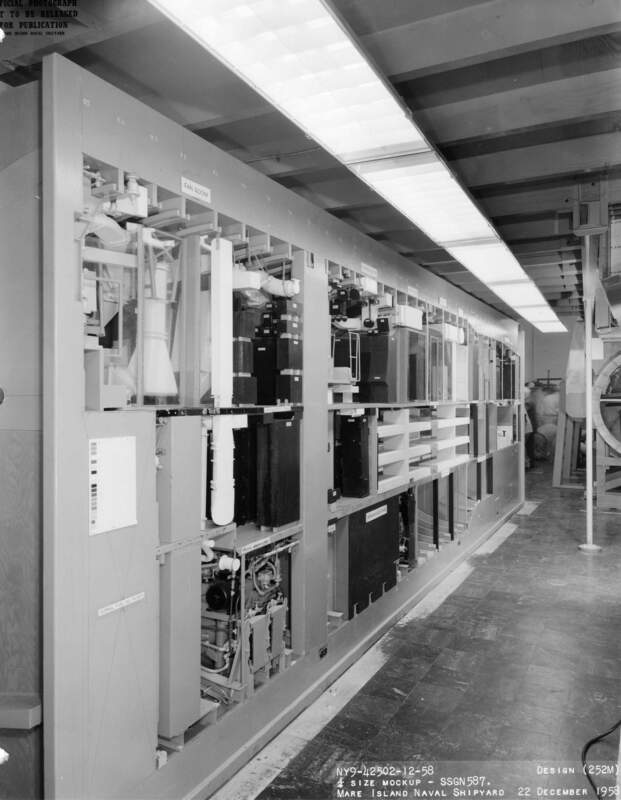 187k Steering and Diving control station for Halibut (SSGN-587) prior to installation aboard ship. USN photo # 43099-2-59, courtesy of Darryl L. Baker. 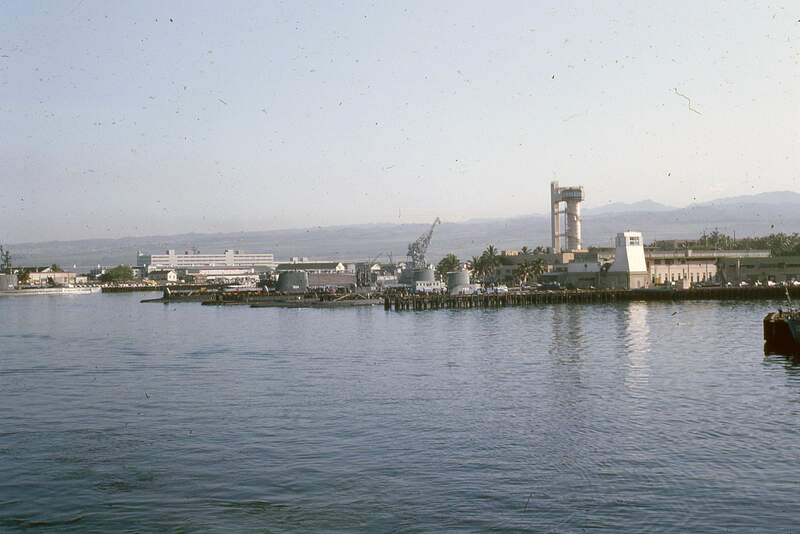 324k Amidships looking forward plan view of Halibut (SSGN-587) being outfitted at Mare Island on 1 April 1959. USN photo # 43833-4-59, courtesy of Darryl L. Baker. 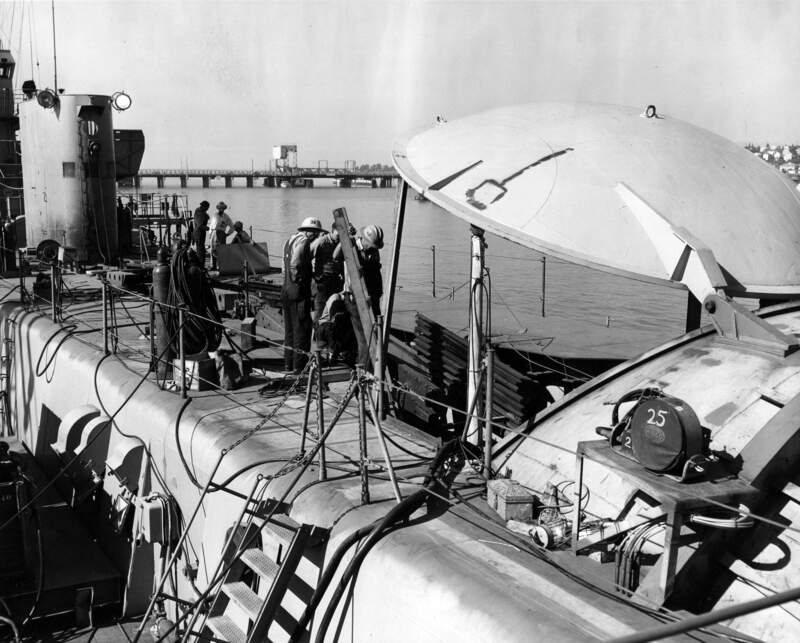 274k Aft plan view of Halibut (SSGN-587) being outfitted at Mare Island on 1 April 1959. USN photo # 43834-4-59, courtesy of Darryl L. Baker. 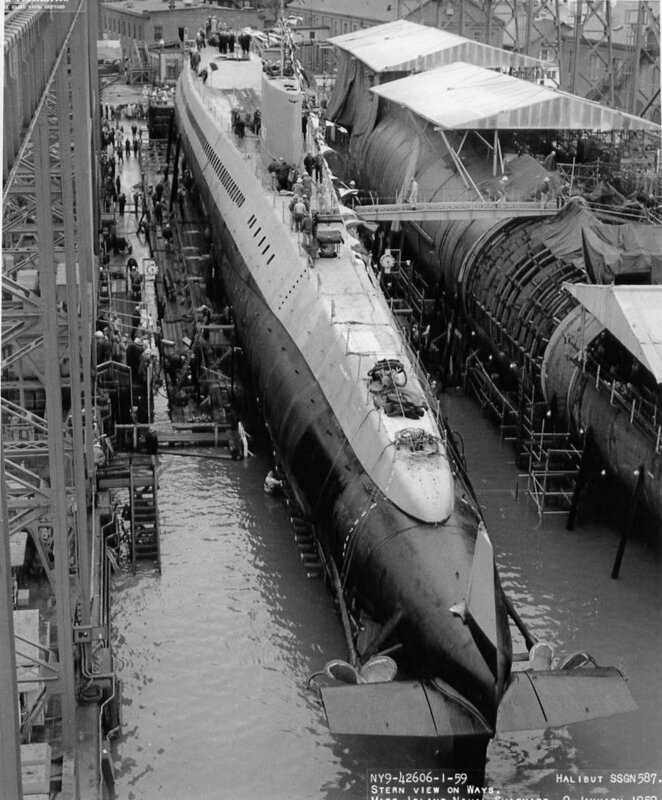 59k The Halibut (SSGN-587) is seen in dry dock #2 on 9 May 1959 during core loading and she remained in dock until 14 June 1959. USN photo courtesy of Darryl L. Baker. 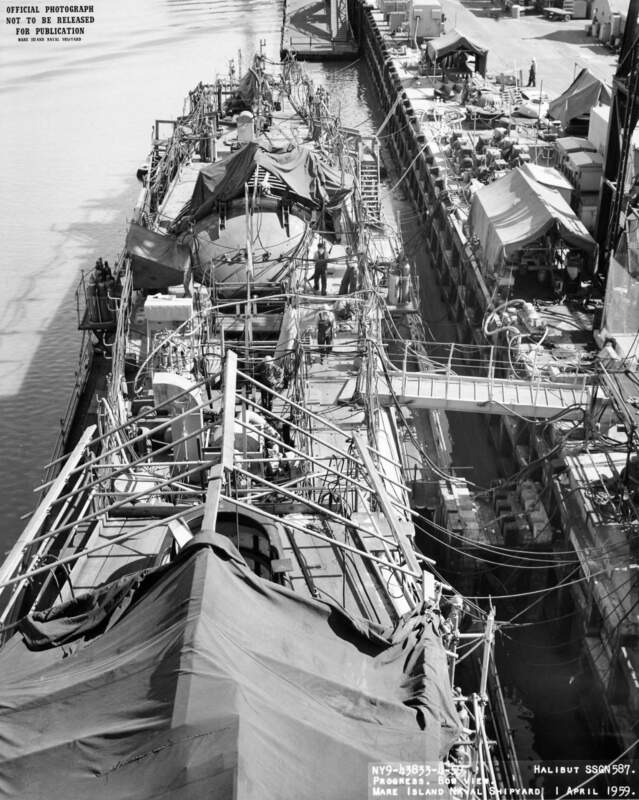 299k Amidships looking forward plan view of Halibut (SSGN-587) being outfitted at Mare Island in August 1959. Forward of Halibut is YSR-6 (Big W) bilge wheelerizing barge and Theodore Roosevelt (SSBN-600) just visible on the building ways behind YSR-6 to the right. USN photo # 45615-8-59, courtesy of Darryl L. Baker. 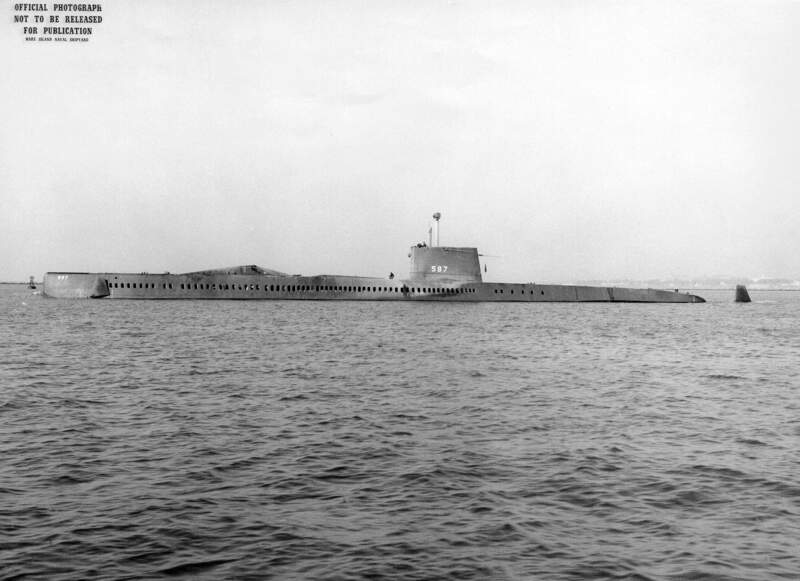 744k Halibut (SSGN-587) on the surface on 12 November 1959 in San Francisco Bay. USN photo # 46235-11-59 courtesy of Vallejo Naval and Museum via Darryl L. Baker. 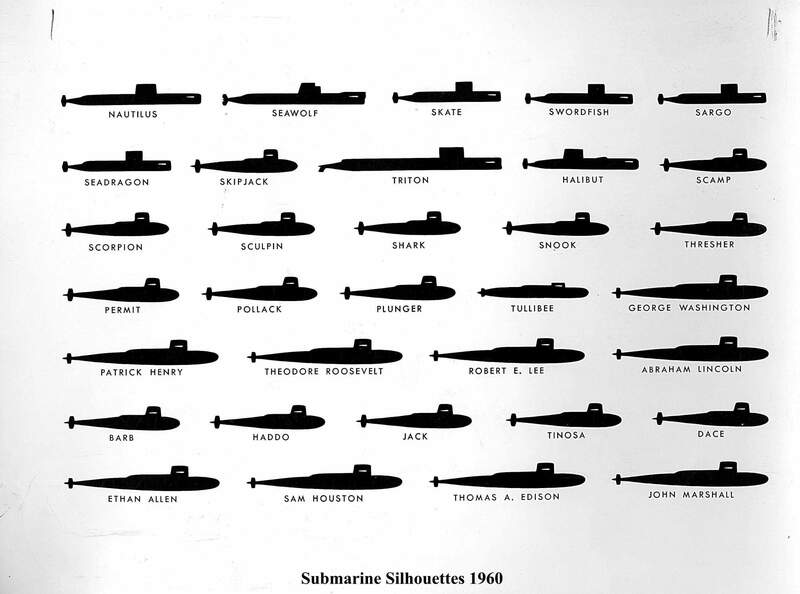 Nautilus (SSN-571), Seawolf (SSN-575), Skate (SSN-578), Skipjack (SS-585), Triton (SSRN-586), Halibut (SSGN-587), Thresher (SSN-593), Tullibee (SSN-597), George Washington (SSBN-598), & Ethan Allen (SSBN-608) classes. 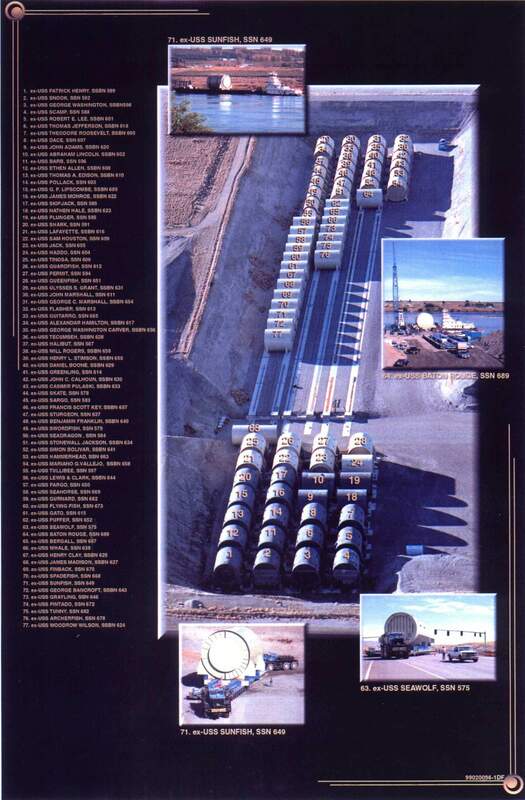 USN photo submitted by Ron Titus, courtesy of Ingersoll-Rand. 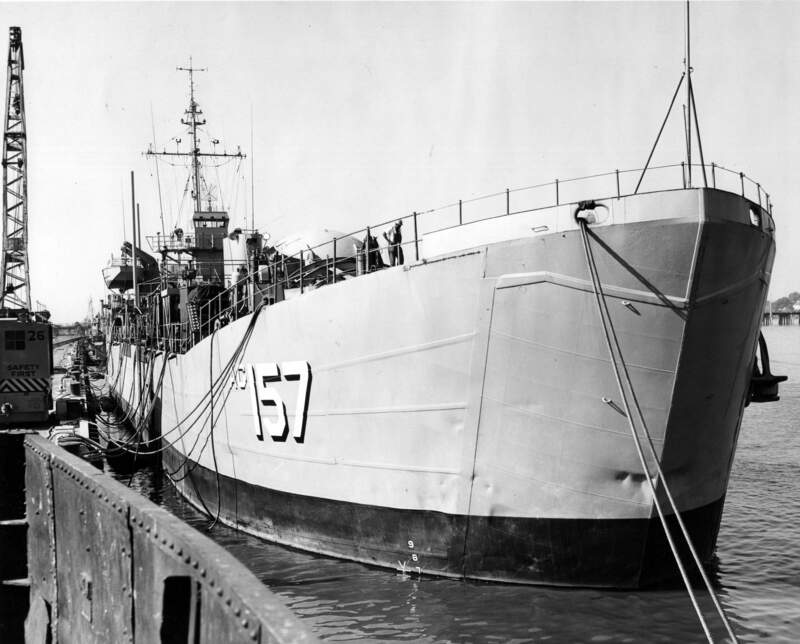 Corp.
61k The Halibut (SSGN-587) is shown during her commissioning on 4 January 1960 at Mare Island Naval Shipyard. USN photo courtesy of Darryl L. Baker. 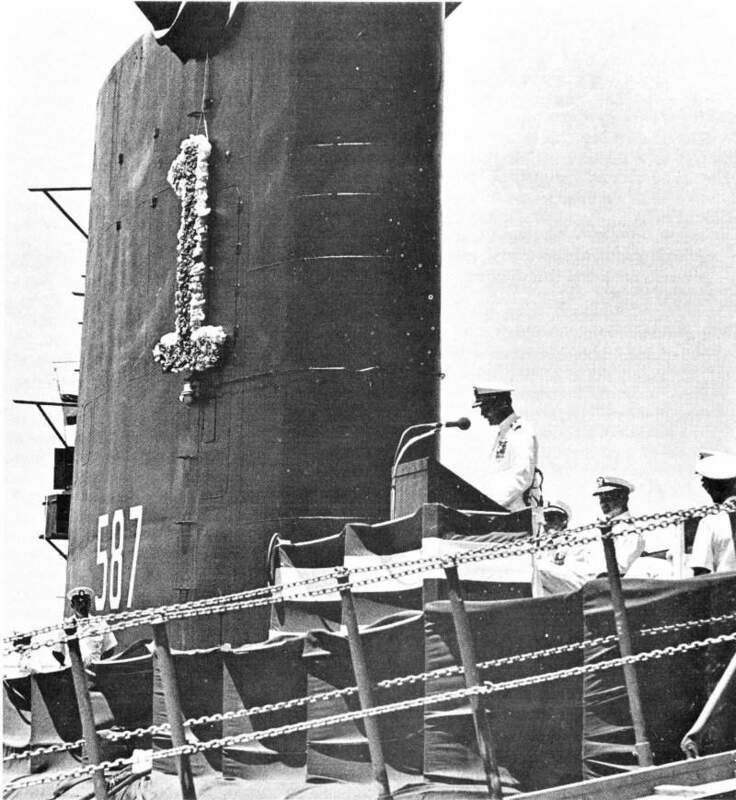 65k RADM William E. Ferrall, USN, Commander of the Pacific Submarine Force, delivers the commissioning address for the Halibut (SSGN-587) on 4 January 1960 at Mare Island as other members of the commissioning party listen in the background. From left are Capt. Karl Wheland, USN, Sub Ad commander; RADM L. V. Honsinger, USN, Shipyard Commander; LCDR Walter Dedrick, USN, Halibut Commanding Officer; Mrs. Chet Holifield, Halibut sponsor, RADM George L. Russell, USN 12th Naval District Commandant, and CDR H. W. Buckingham, CHC, USN, shipyard chaplain. USN photo courtesy of Darryl L. Baker. 217k 3 page PDF of the Commissioning Program for the Halibut (SSGN-587) at Mare Island on 4 January 1960. USN photos courtesy of Darryl L. Baker. 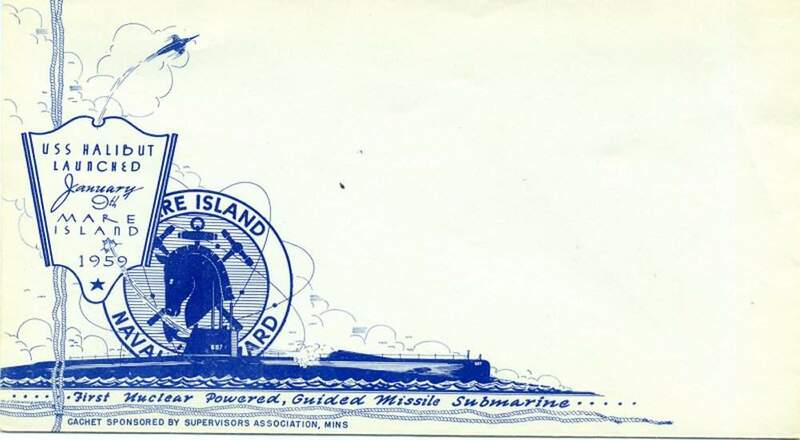 7 55k Cachet designed for the launching of the Halibut (SSGN-587) at Mare Island on 4 January 1960. USN photo courtesy of Darryl L. Baker. 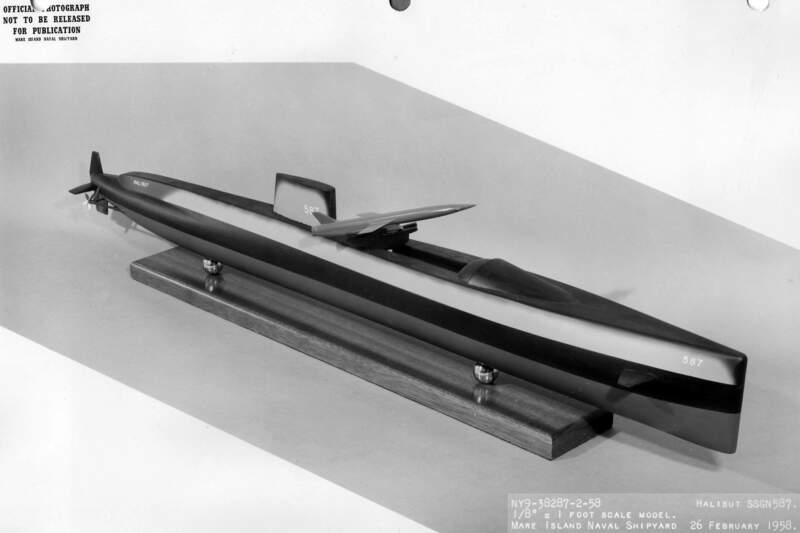 130k Model of the Halibut (SSGN-587) in the "as built" Regulus submarine version 1960. Photo courtesy of Tom Dougherty. 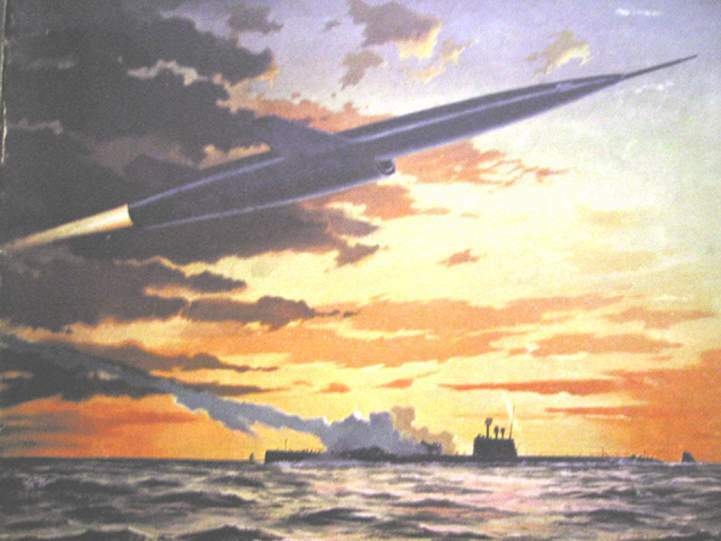 40k Artists conception of Halibut (SSGN-587) firing a Regulus missile. Courtesy of Nick Spark. 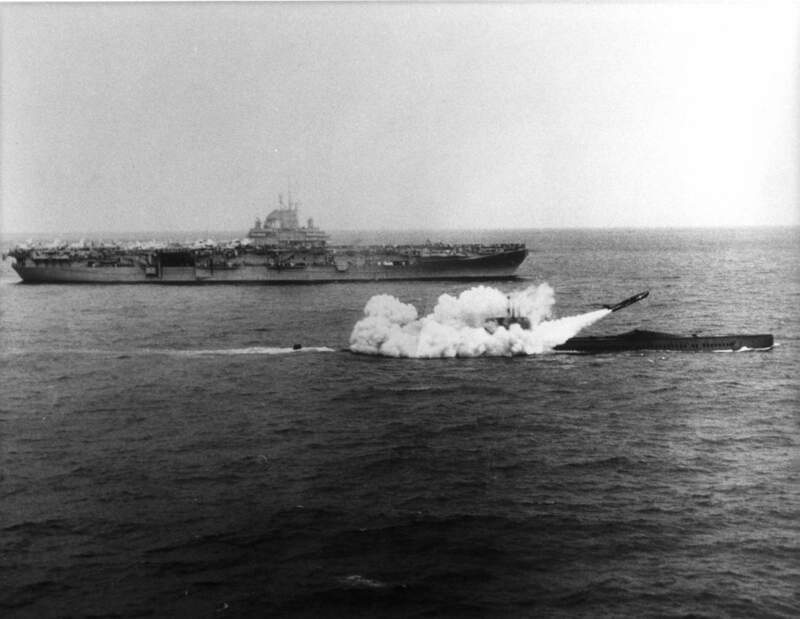 113k Halibut (SSGN-587) firing a Regulus missile in front of the Lexington (CV-16), 25 March 1960, the first nuclear powered submarine to successfully launch a guided missile. Courtesy of Nick Spark. 44k The Halibut (SSGN-587) departed for her shakedown cruise 11 March 1960. On the way to Australia, 25 March, she became the first nuclear powered submarine to successfully launch a guided missile. 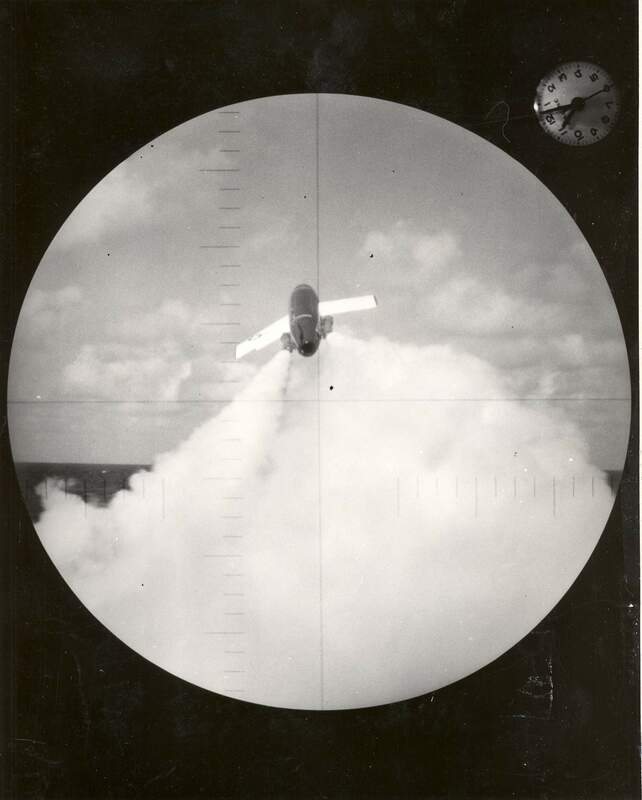 She is pictured here firing a Regulus 1 missile on 31st March 1960. Partial text courtesy of DANFS. USN photo courtesy of Robert Hurst. 248k Halibut (SSGN-587) goes south: Auckland NZ, 21 April 1960. Photo by Chris Howell, courtesy of John Hummel, USN (Retired). 434k Halibut (SSGN-587) goes south: Auckland NZ, 21 April 1960. Photo by Chris Howell, courtesy of John Hummel, USN (Retired). 824k 26 April 1960:(Regulus radio control missile, on top of Halibut (SSGN-587), Overseas Passenger Terminal, Oriental Bay, Wellington) Photo # FL13661700, courtesy of National Library of New Zealand via Stephen Gower. 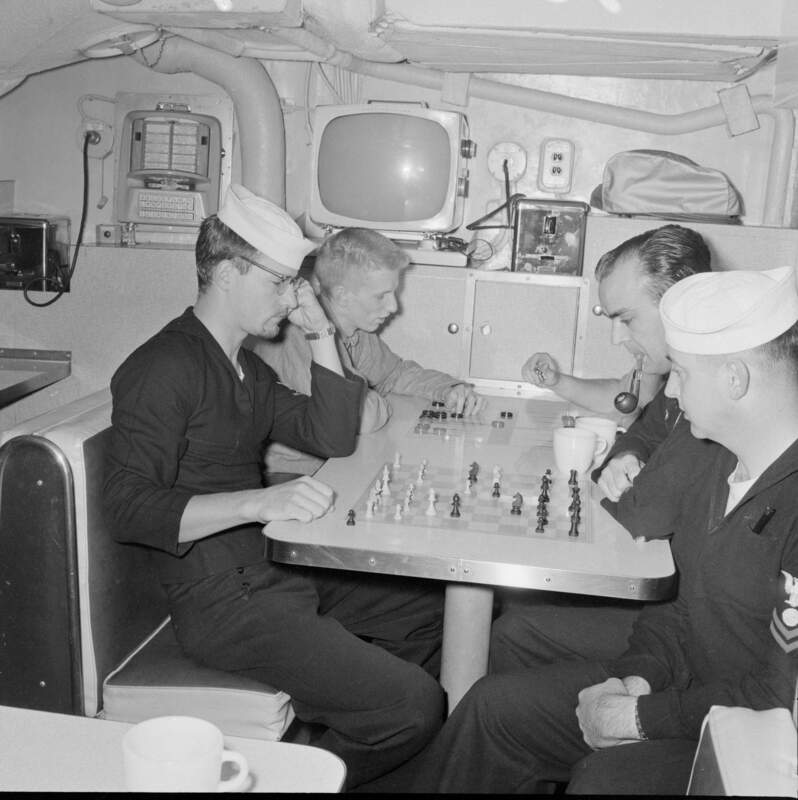 758k 26 April 1960: (sailors playing board games, in the mess area). Photo # FL13661728, courtesy of National Library of New Zealand via Stephen Gower. 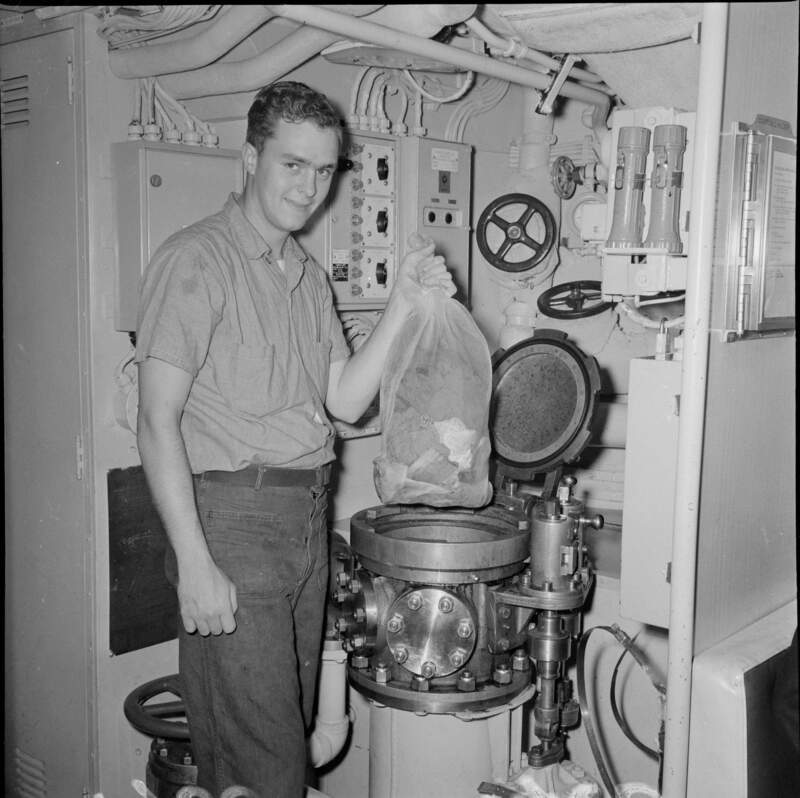 853k 26 April 1960: (unidentified sailor preparing to drop garbage/trash into the GDU (Garbage Disposal Unit)). Text i.d. courtesy of Terry Byrd. Photo # FL13661396, courtesy of National Library of New Zealand via Stephen Gower. 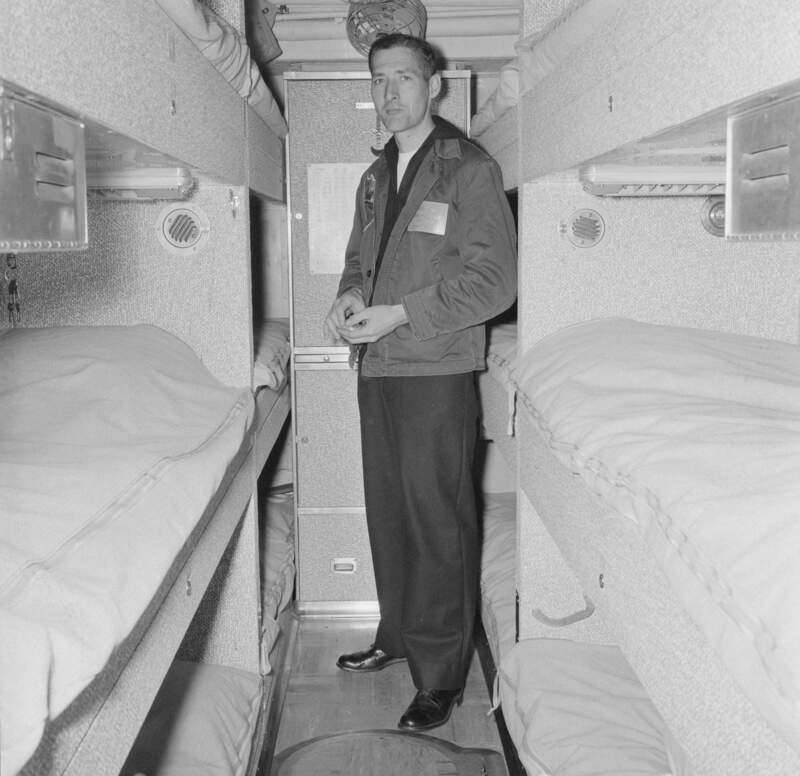 742k 26 April 1960: (unidentified sailor, standing in sleeping quarters). Photo # FL13661572, courtesy of National Library of New Zealand via Stephen Gower. 386k 27 April 1960: Regulus radio control missile on top of Halibut (SSGN-587), Overseas Passenger Terminal, Oriental Bay, Wellington. Photo # FL13661494, courtesy of National Library of New Zealand via Stephen Gower. 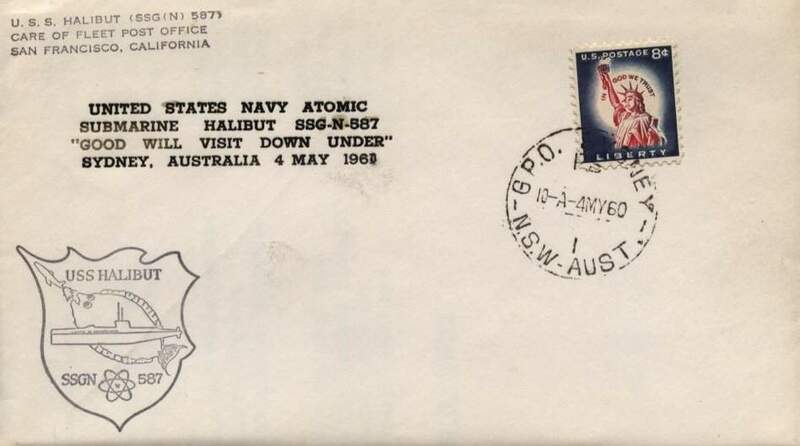 41k Commemorative postal cover issued on the occasion of Halibut's (SSGN-587) visit to Australia, 4 May 1960. Courtesy of Jack Treutle (of blessed memory). 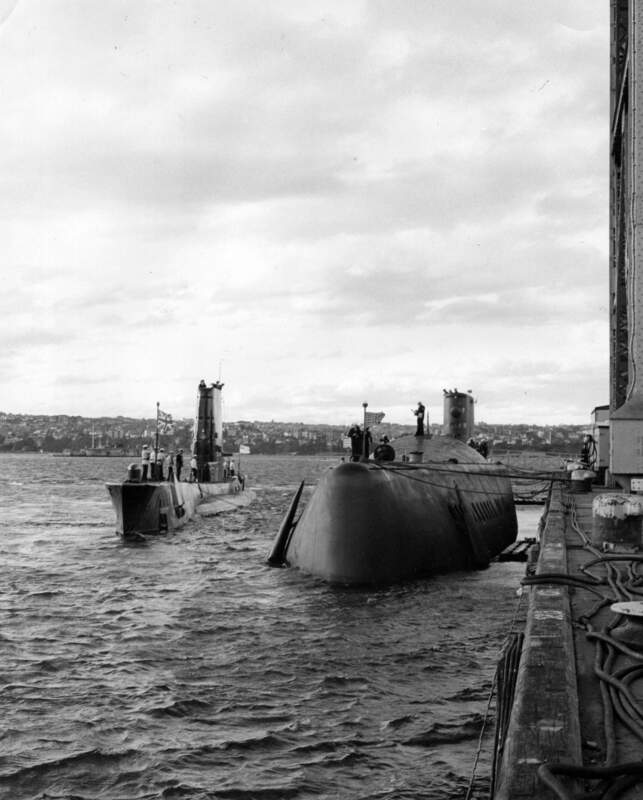 1.80k Halibut (SSGN-587) at Sydney, Australia between 1- 7 May 1960 with the British submarine HMS Anchorite outboard. Photo # 7240-6-1960, courtesy of the Vallejo Naval and Historical Museum via Darryl L. Baker. 2.20k Aerial view of the Halibut (SSGN-587) circa 1962. Photo # 7240-6-1960, courtesy of the Vallejo Naval and Historical Museum via Darryl L. Baker. 604k Halibut (SSGN-587) at sea off of US Naval Submarine Base, Pearl Harbor, Hawaii on 16 October 1962 with VSH-8602 (or) 8601. Bob Koscak was a Hospital Corpsman (HM3) serving with the First Marine Brigade at Kaneohe Marine Corps Air Station on Oahu from 1963-1965. During 1964 a platoon-size (40?) commando group of Marines was formed from the 3rd Battalion, 4th Marine Regiment, and he was the Marine unit Corpsman. They trained extensively for about 6 weeks and culminated their training aboard the Halibut for a number of days, probably in the early fall of 1964. They were not scuba certified, but did all their training surface swimming and with rubber boats. Training consisted of launching the boats by throwing them over the side and paddling them into shore. Another technique was to place the boats on the sub deck and the sub then gradually submerged, leaving them to paddle away (for all their lives). Pick up techniques were by grouping the boats together into 2 groups, and the sub would snag the rope connecting the boat groups with its periscope, towing them out to sea where they could be picked up and boats recovered. They also used that technique to launch boats. Because of those "periscope" recovery efforts he got to claim that he was one of the few people in the world to get run over by a submarine twice in one day. A story for another time. Photo i.d. & text courtesy of Bob Koscak. USN photo by Photographer C.F. Labertew, SA, from the collection of W.P. Jones. 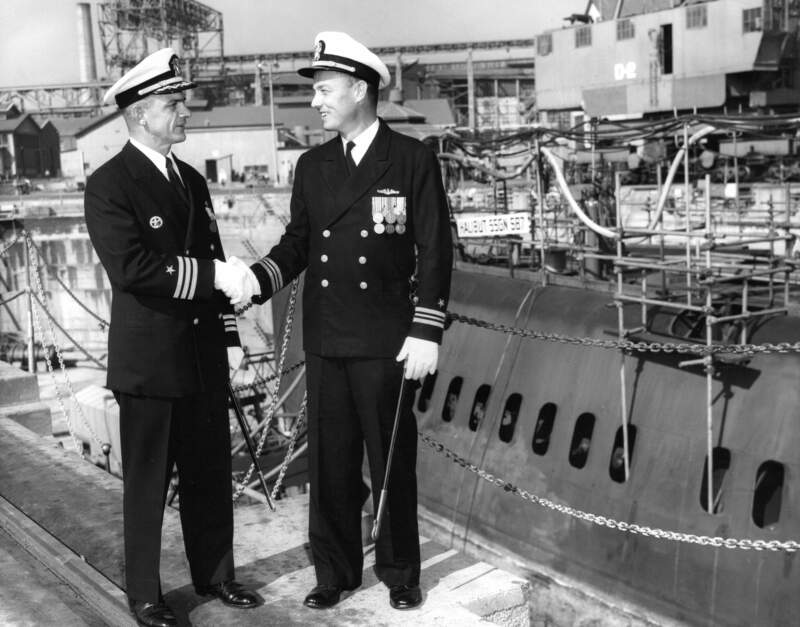 706k CDR Warren R. Cobean (left) is relieved by LCDR John F. Mangold on 1 November 1962 as commanding officer of the Halibut (SSGN-587) at Mare Island. CDR Cobean new assignment will be Commanding Officer (Gold) of James Monroe (SSBN-622). Photo courtesy of the Vallejo Naval and Historical Museum via Darryl L. Baker. 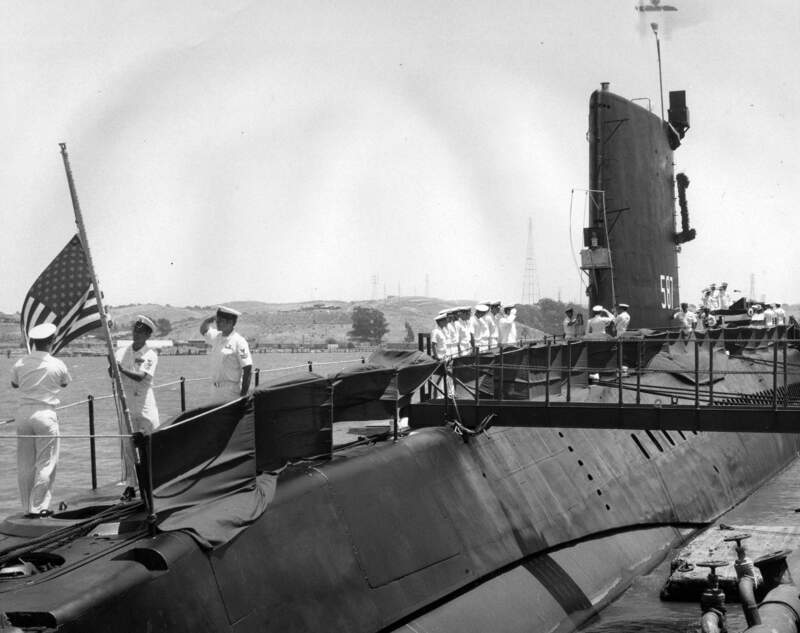 355k General view of the 1962 Change of Command of Halibut (SSGN-587) at Mare Island on 1 November 1962. The ship is in the yard's dry dock #2 for overhaul. Photo courtesy of the Vallejo Naval and Historical Museum via Darryl L. Baker. 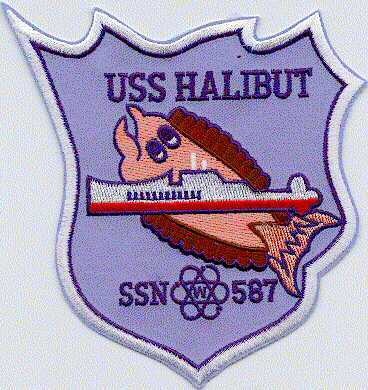 Halibut (SSGN-587). Photograph courtesy of Ron Phillipi. 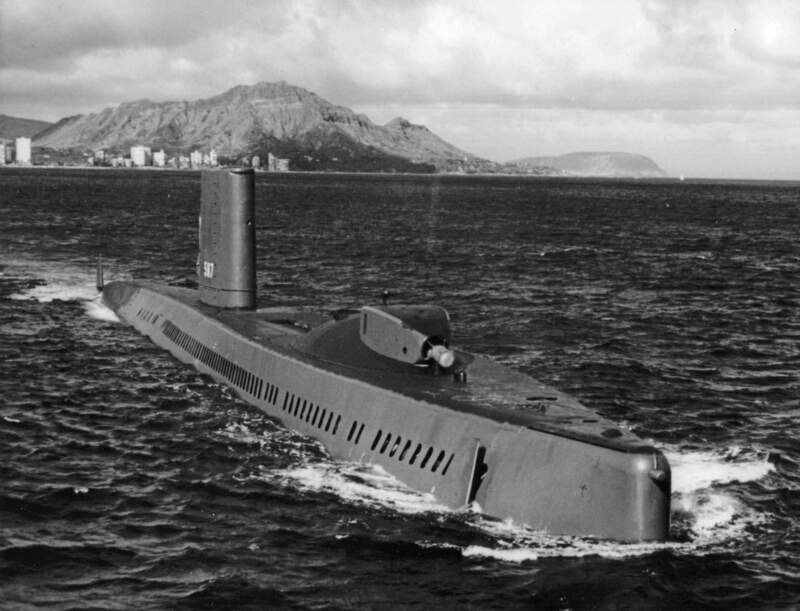 594k Halibut (SSGN-587) with Diamond Head in the background in late 1965. Note her topside thruster and she has no DSRV habitat. USN photo courtesy of Darryl L. Baker. 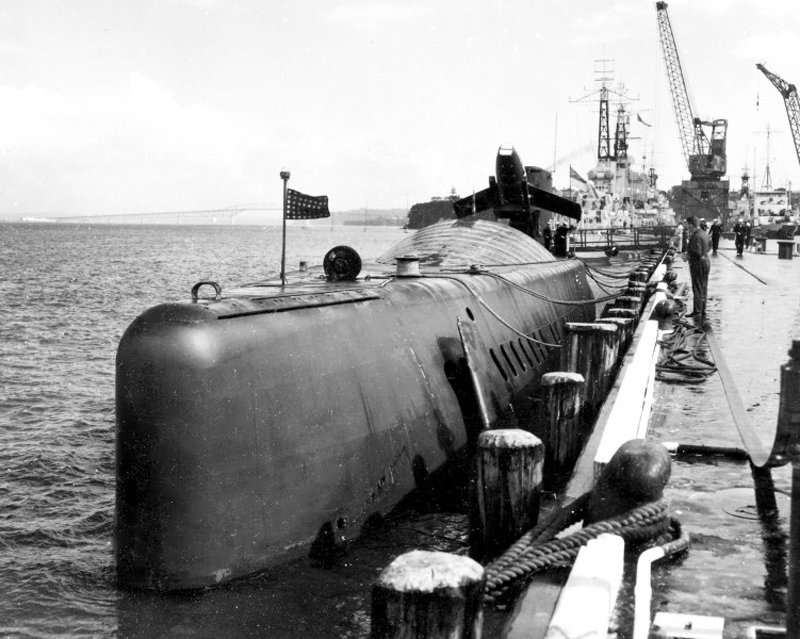 564k Submarine are from left to right: Halibut (SSGN-587), Pickerel (SS-524), Perch (LPSS-313), Unidentified, Sterlet (SS-392) at Submarine Base Pearl Harbor on 12 April 1967. USN photo courtesy of Darryl L. Baker. Photo i.d. courtesy of John Hummel, USN (Retired). & Dave Johnston (USNR). 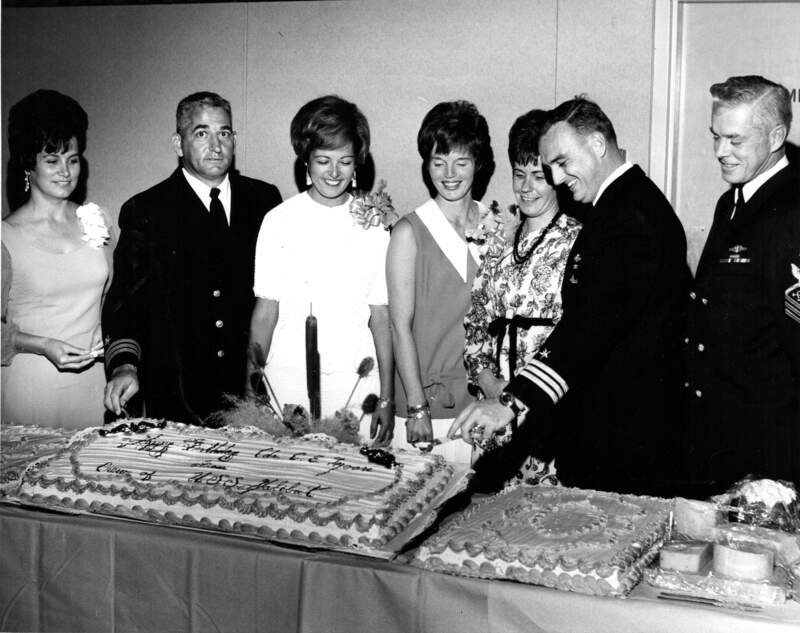 424k The cake cutting ceremony at the 8 November 1969 cocktail buffet for the crew and wives of the Halibut (SSN-587). The party marked the birthday of the submarines former commanding officer CDR C. E. Moore and welcoming of the new commanding officer CDR John E. McNish. 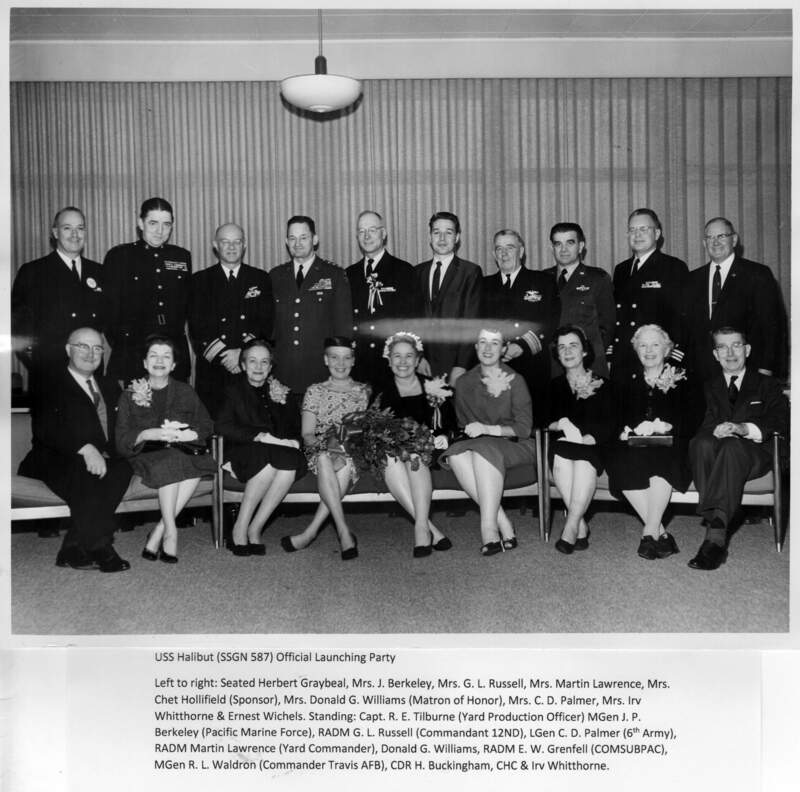 Left to right: Mrs. Ted Lee; CDR and Mrs. C. E. Moore; Mrs. Roger F. Bacon; Mrs. and CDR John E. McNish & Senior Chief Ted Lee (COB). USN photo 940X1-11-69 TH courtesy of Vallejo Naval and Historical Museum via Darryl L. Baker. 603k Program of her change of command in November 1969. Photo courtesy of the Vallejo Naval and Historical Museum via Darryl L. Baker. 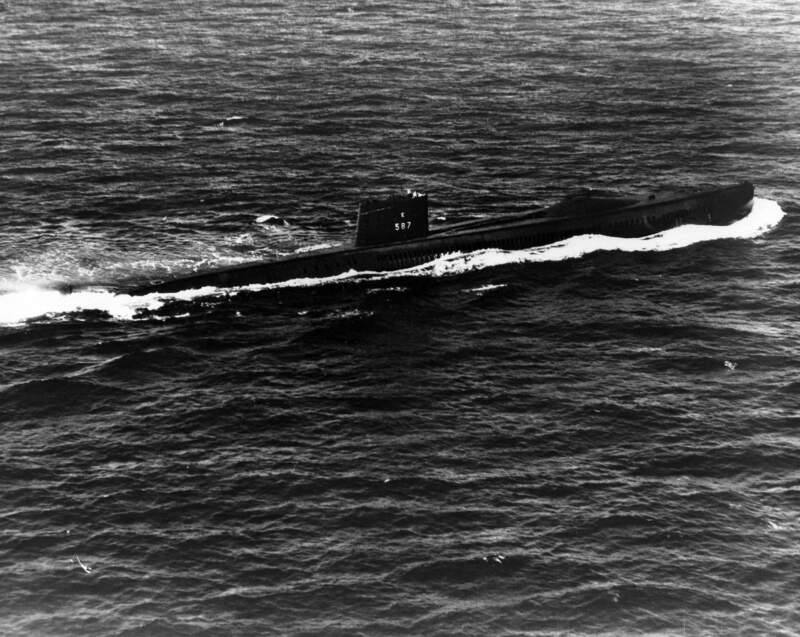 135k Starboard view of the Halibut (SSGN-587) underway, possibly circa early 1970's. Courtesy of Thomas McLoughlin. 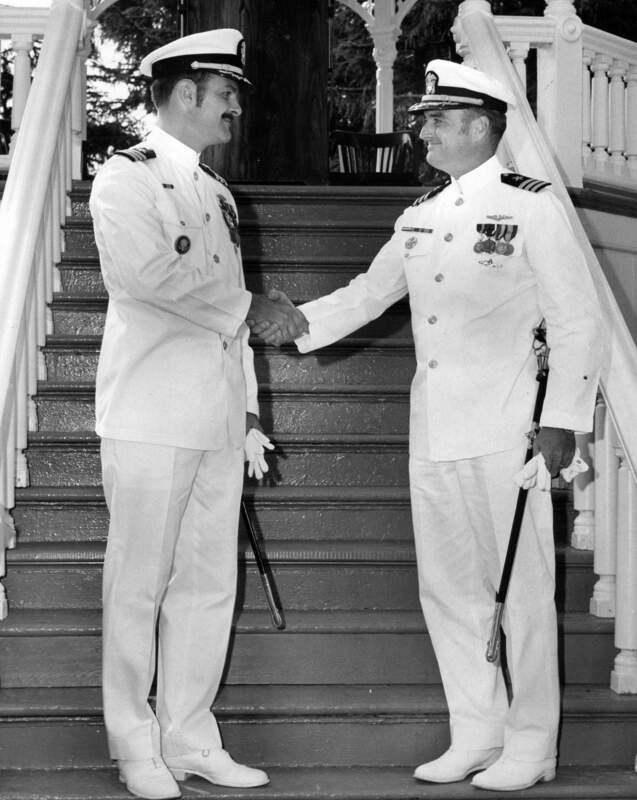 765k CDR Charles R. Larson, left, new commanding officer of Halibut (SSN-587) shakes hands with the former commanding officer of Halibut, CDR John E. McNish at the change of command ceremony on 5 August 1973. Photo courtesy of the Vallejo Naval and Historical Museum via Darryl L. Baker. 7 160k Admiral Charles R. Larson was a 1958 graduate of the United States Naval Academy, Larson twice served as Superintendent of the U.S. Naval Academy in Annapolis, Maryland. He also served as Commander in Chief, United States Pacific Command (CINCPAC). His classmates at the Academy included future U.S. Senator John McCain and Vice Admiral John Poindexter. Admiral Larson was the first naval officer selected as a White House Fellow and served his fellowship in 1968 as Special Assistant to the Secretary of the Interior. 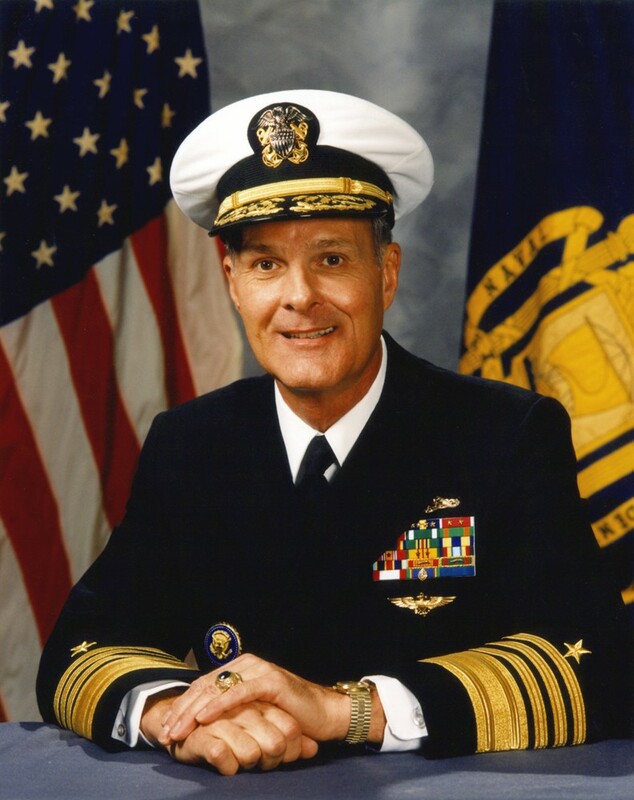 From 1969 to 1971, he served as Naval Aide to the President of the United States. 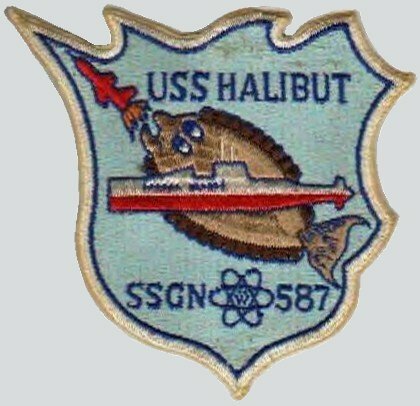 He reported back to sea duty as executive officer of the nuclear attack submarine Sculpin (SSN-590). 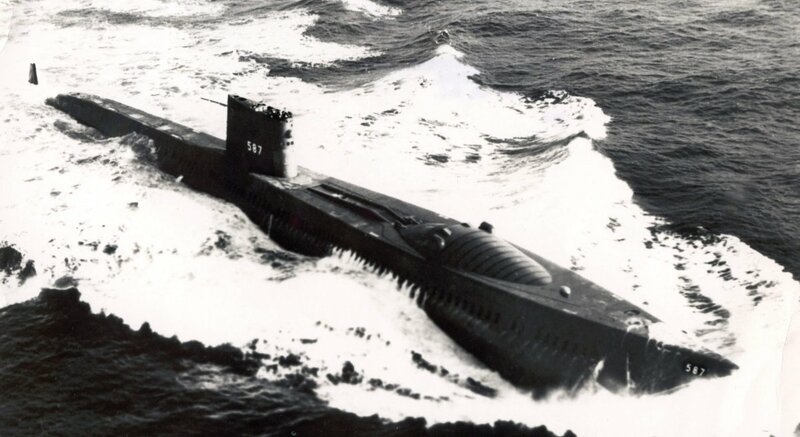 Then from 1973 to 1976, he served as commanding officer of the nuclear attack submarine Halibut (SSGN-587). In 1976, Admiral Larson assumed duties as Commander, Submarine Development Group ONE in San Diego, Calif., in which he headed the Navy's worldwide deep submergence program USN photo courtesy of Bill Gonyo. 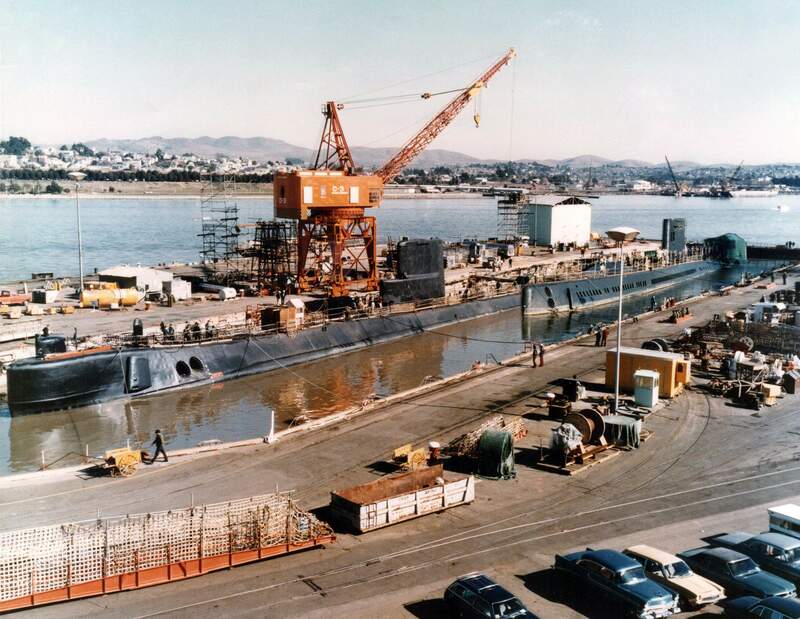 796k The Seawolf (SSN-575) and Halibut (SSGN-587) in Mare Island's dry dock #3 together in January 1975. FYI - Seawolf is forward of Halibut. USN photo courtesy of Vallejo Naval and Museum via Darryl L. Baker. 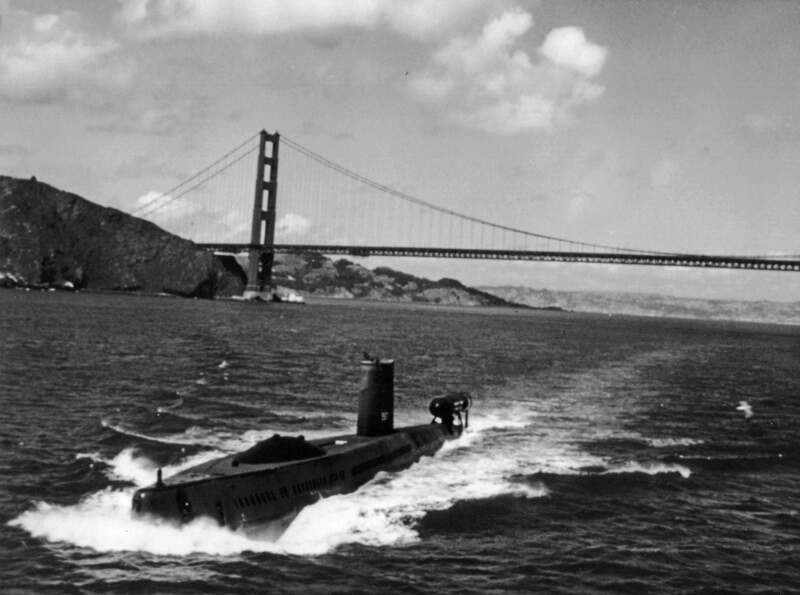 554k View of Halibut (SSGN-587) departing San Francisco likely in the mid 1970's. One of Mare Island's Ocean Engineering Boats. Ocean Engineering is what we called Halibut (SSGN-587), Parche (SSN-683) & Seawolf (SSN-575) and the program to manage them. USN photo courtesy of Darryl L. Baker. 695k Nine page PDF of the decommissioning program for the Halibut (SSGN-587) at Mare Island on 30 June 1976. USN photo courtesy of Darryl L. Baker. 101k Capt. Charles R. Larson, Commanding Officer of Halibut (SSGN-587) addresses a crowd of over 500 persons at the decommissioning of the ship at Mare Island on 30 June 1976. USN photo courtesy of Darryl L. Baker. 1.70k The colors are lowered for the last time aboard the Halibut (SSN-587) during her decommissioning ceremonies at Mare Island on 30 June 1976. Photo courtesy of the Vallejo Naval and Historical Museum via Darryl L. Baker. 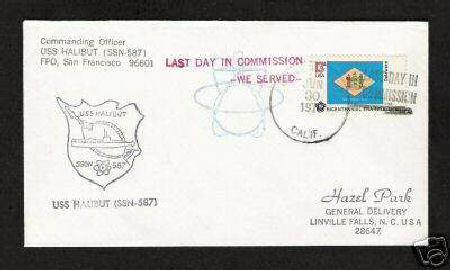 23k Commemorative postal cover marking the Halibut (SSGN-587) last day in commission, 30 June 1976. Courtesy of Jack Treutle (of blessed memory). 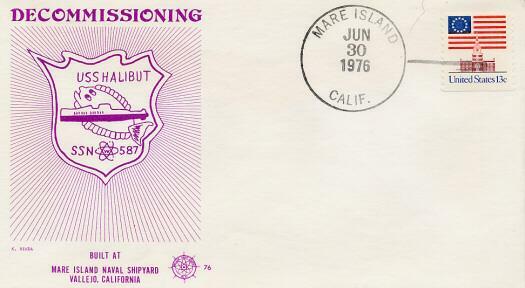 24k Commemorative postal cover marking the Halibut (SSGN-587) decommissioning, 30 June 1976. Courtesy of Richard Leonhardt. 141k Model of the Halibut (SSGN-587) in her later (1970's) Special Operations version. Photo courtesy of Tom Dougherty. 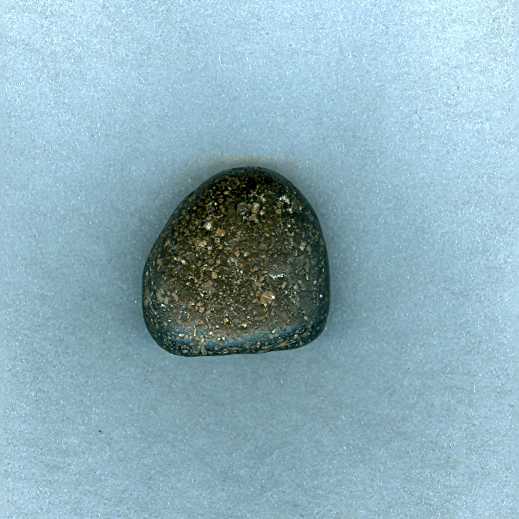 29k This is a granite pebble about the size of a 50 cent piece recovered from the Sea of Okhotsk between the Kamchatka peninsula and the Russian mainland during one of the spy missions by the Halibut (SSGN-587) to recover data from the "pod" that was left next to an underwater telephone line to monitor Soviet Naval messages. Courtesy of Ric Hedman. 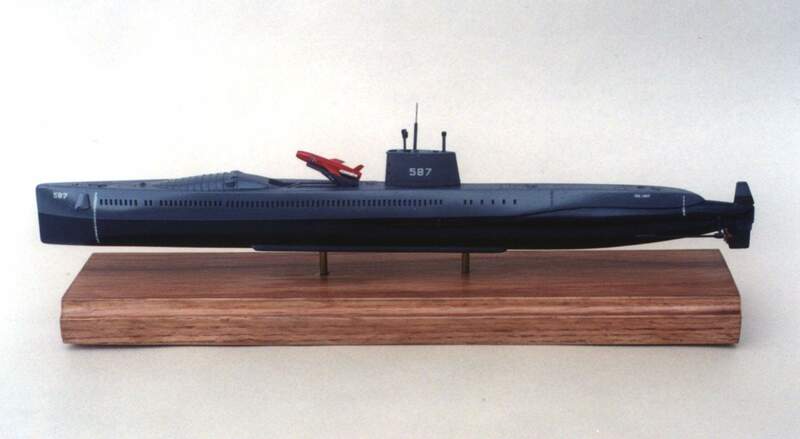 62k Model of the Halibut (SSGN-587), at the time of her decommissioning. The model is incorrect, in that it has fairings leading to the leading edge of the rear planes. Courtesy of Nick Spark. 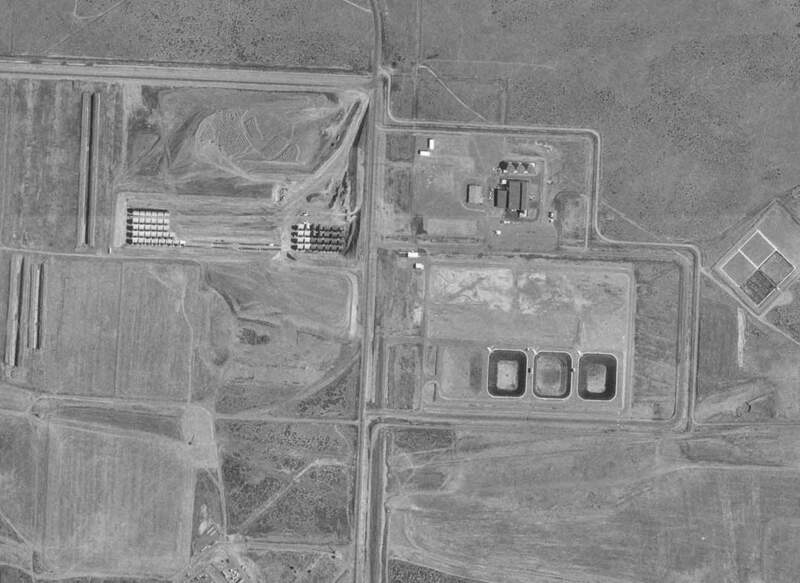 83k Trench 94, Hanford Site, Washington, 1994. 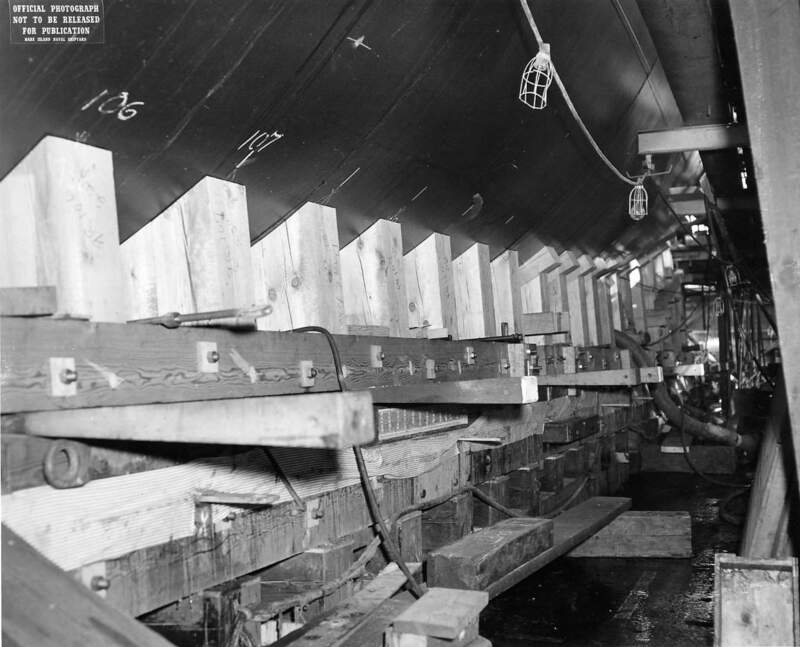 Hull sections containing defueled reactor compartments of decommissioned nuclear-powered submarines are put in disposal trenches. Once full, the trench will be filled with dirt and buried. The compartments are expected to retain their integrity for more than 600 years. USN photo & partial text courtesy of home.flash.net/~tomj/tunny/chop/rx. & submitted by Jack Treutle (of blessed memory).